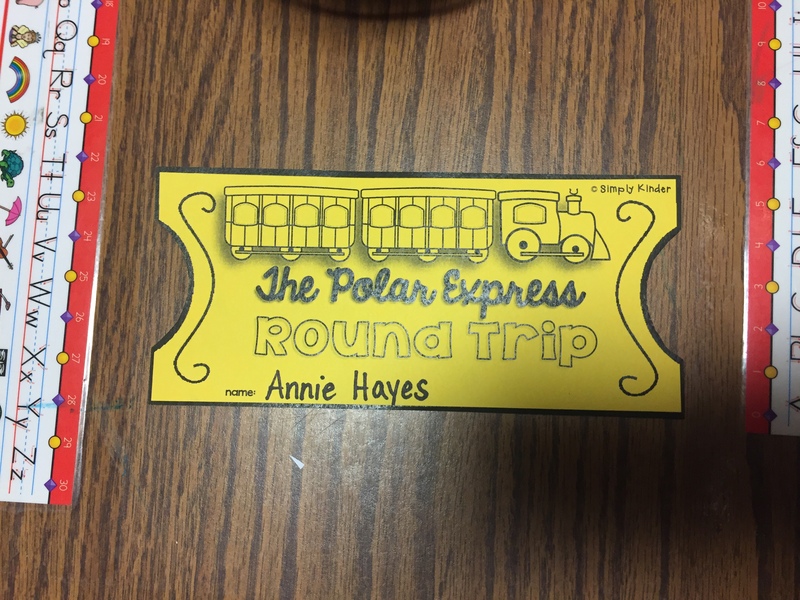 This last week Friday we finished off our Polar Express week with our very special Polar Express day!! 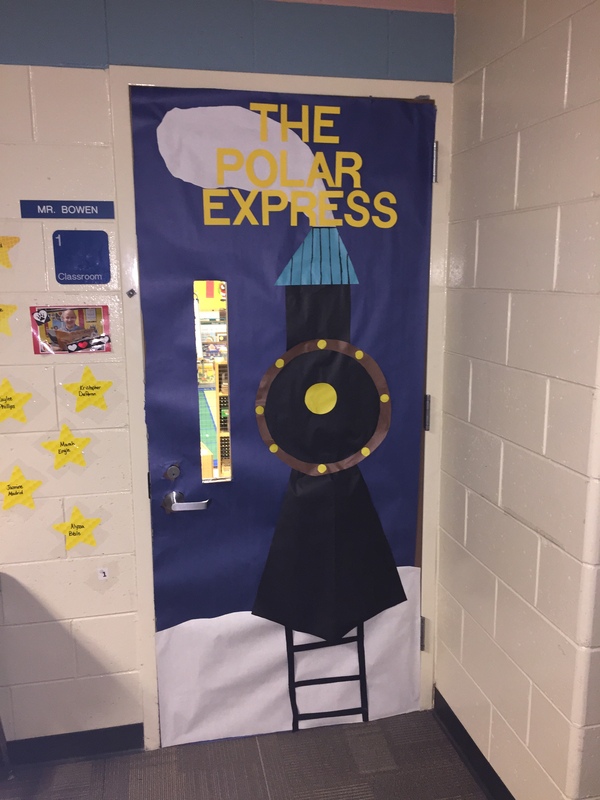 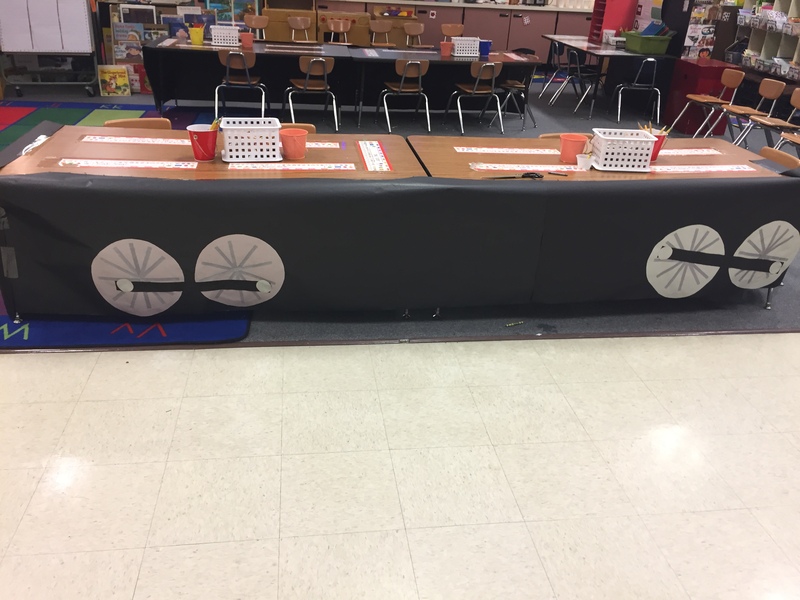 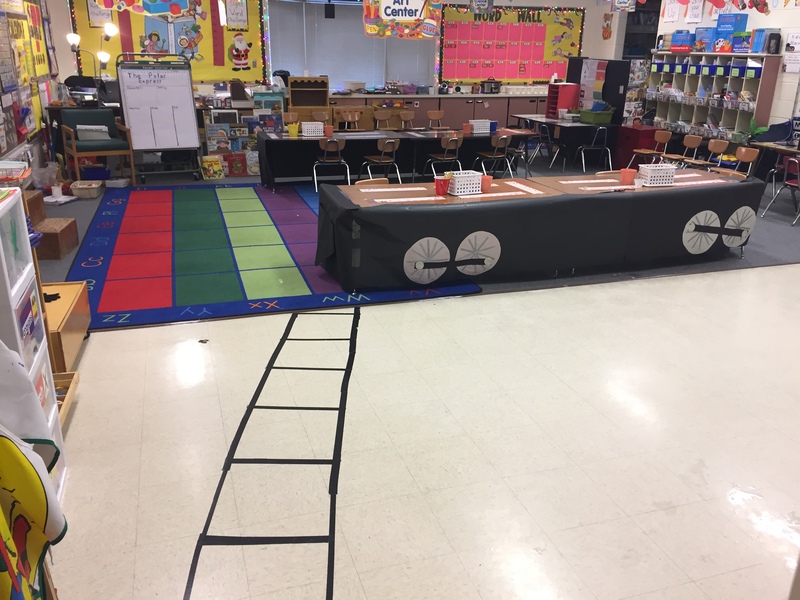 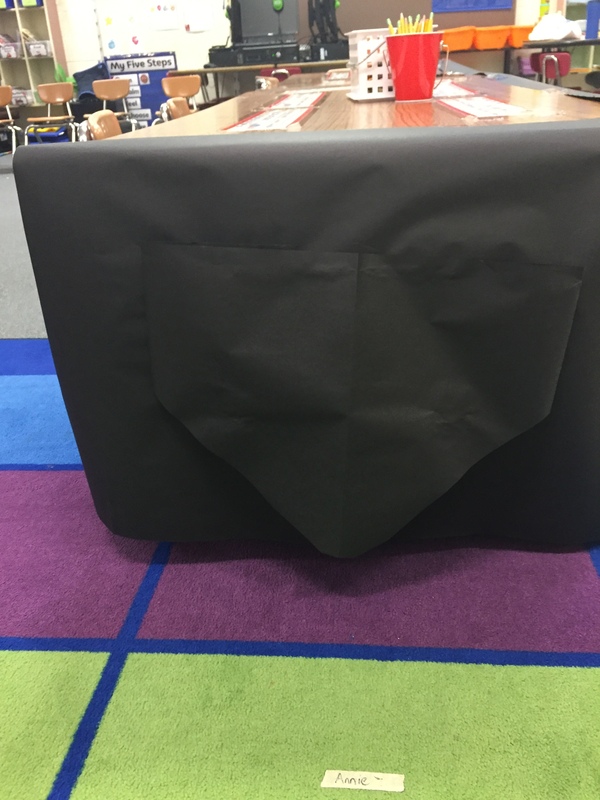 At the beginning of this week I decorated the front of our classroom door and on Friday before school I decorated the tables in the room to look like the Polar Express. 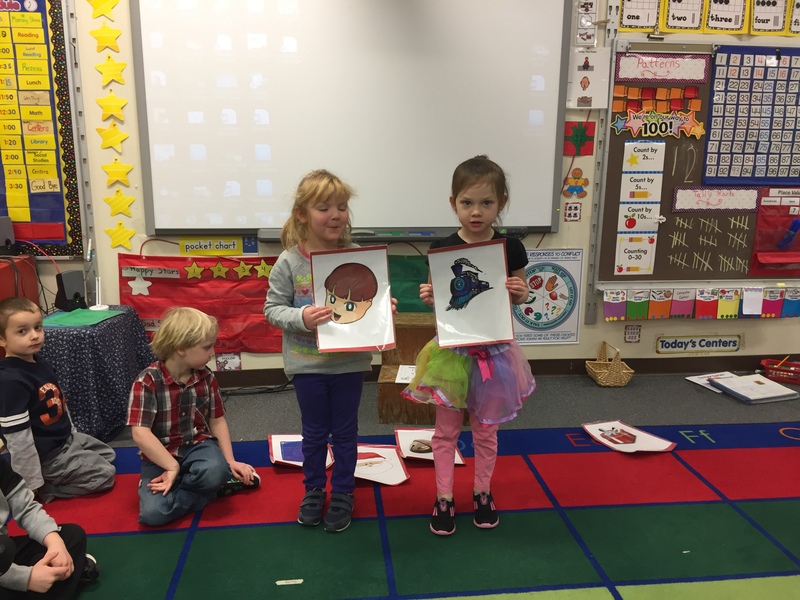 The class got to also come to school wearing pajamas like the children in the book got to wear. 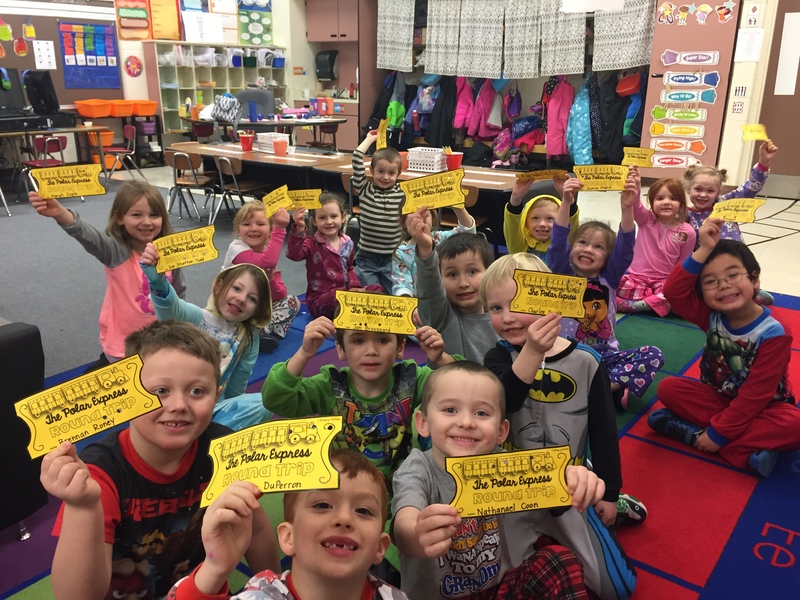 Students were given golden tickets to the Polar Express as they went off to lunch. 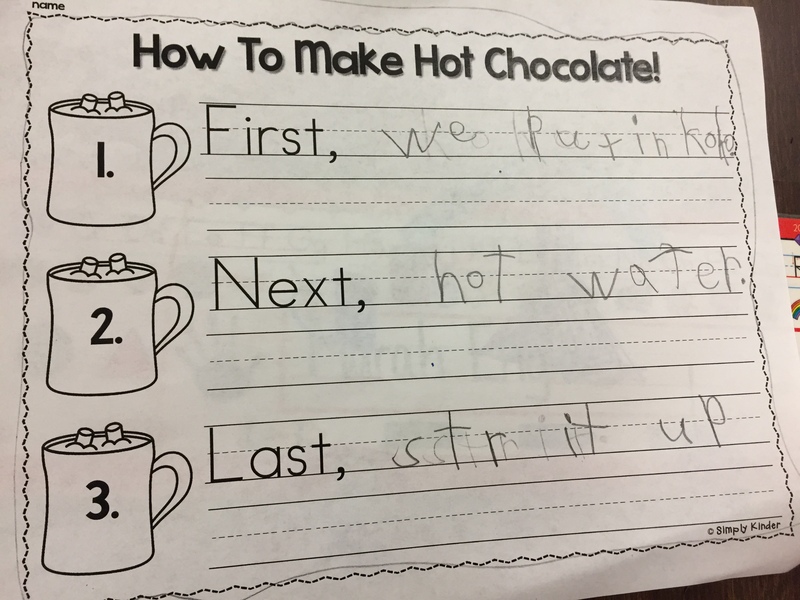 When they came back from lunch they gave me their golden tickets and I punched holes in them like the conductor did in the movie. 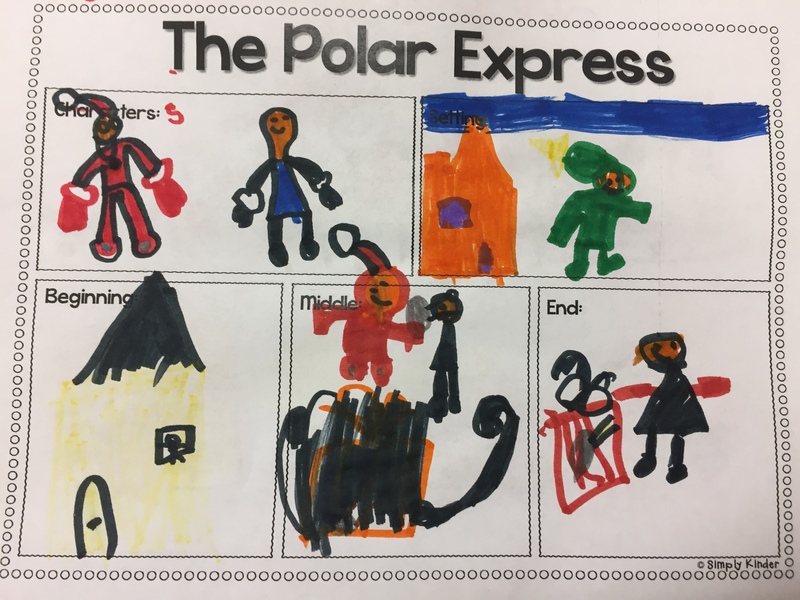 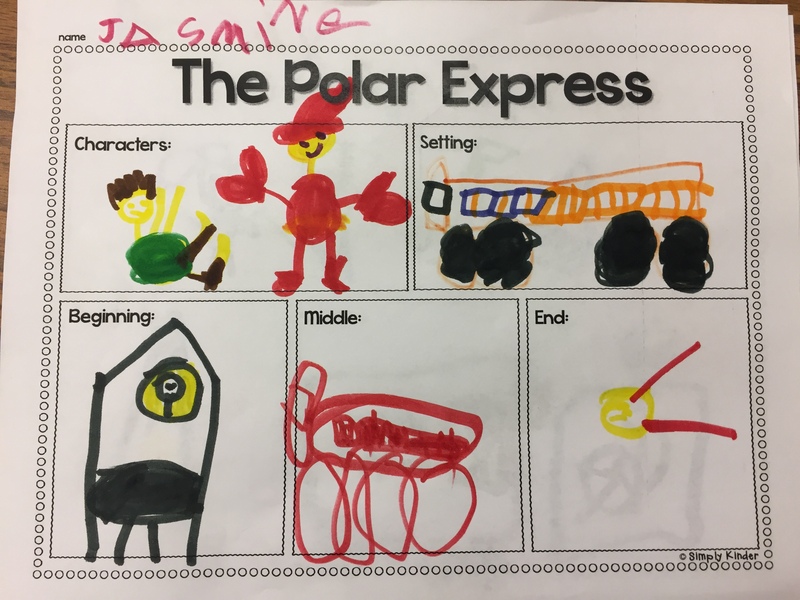 We then reread the book the Polar Express by Chris Van Allsburg and discussed the elements of the story and drew the pictures of the things we discussed. 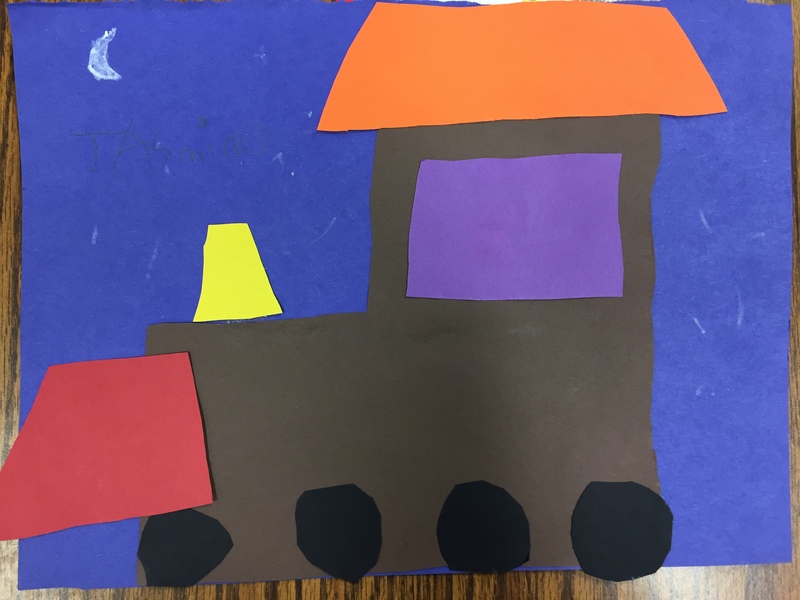 Finally students got to sit in our “train area” like they would sit on the train and watch the movie. 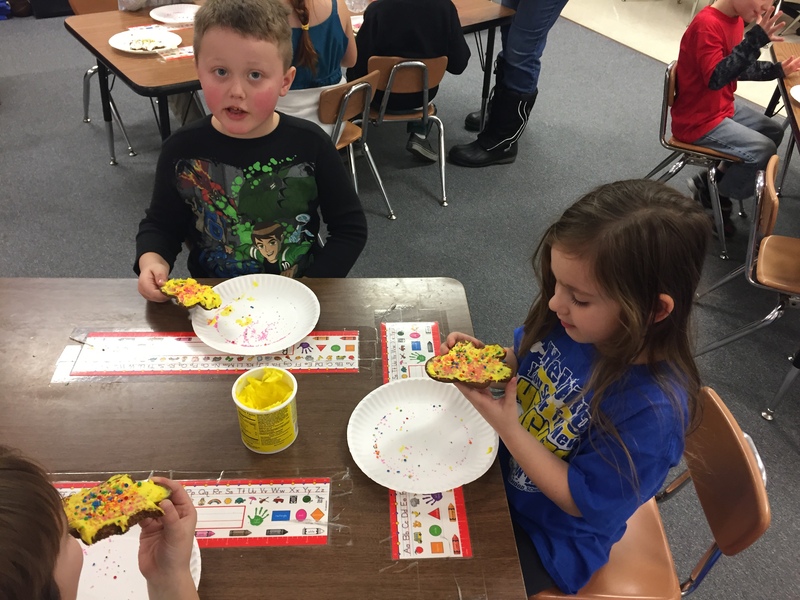 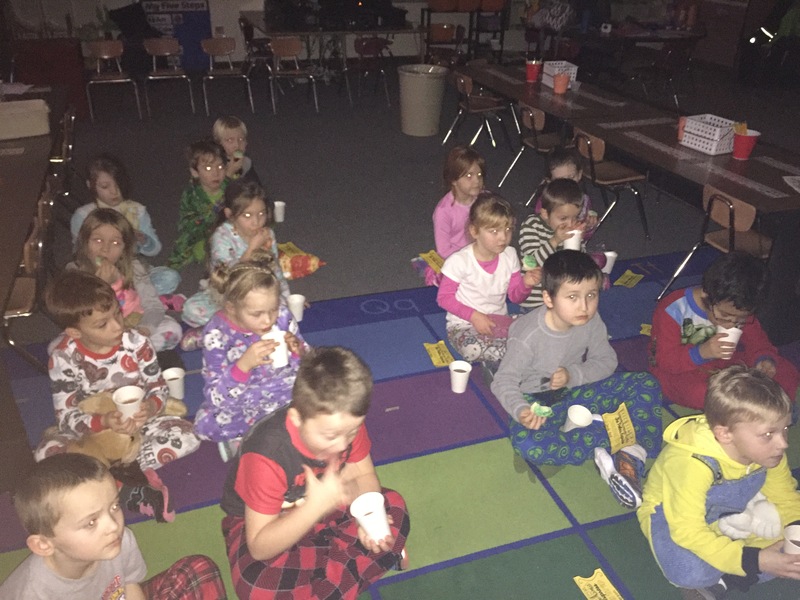 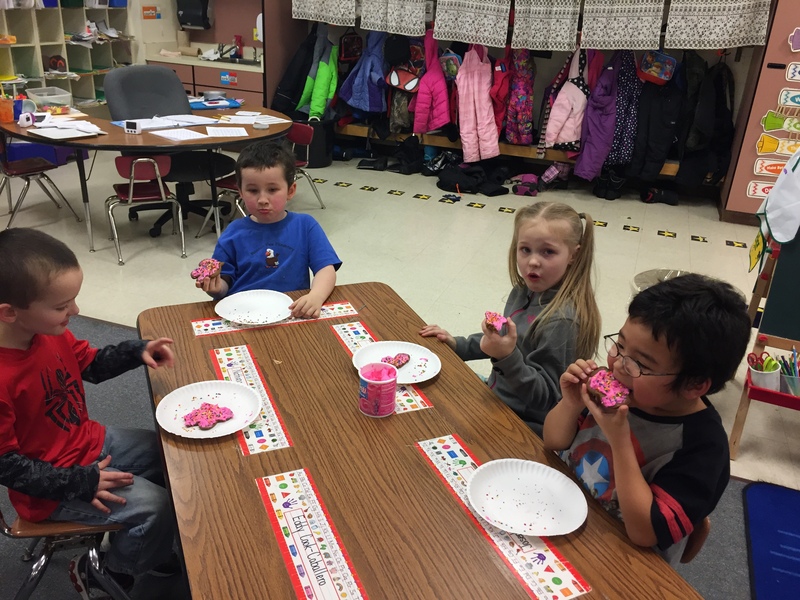 Students got to enjoy cookies and hot chocolate while they watched the movie. 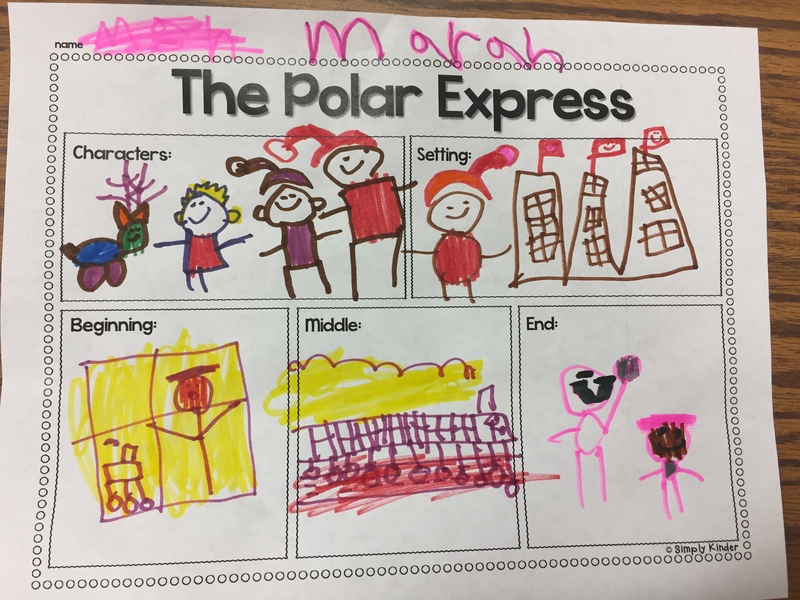 We finished off our Polar Express week with talking about Santa. 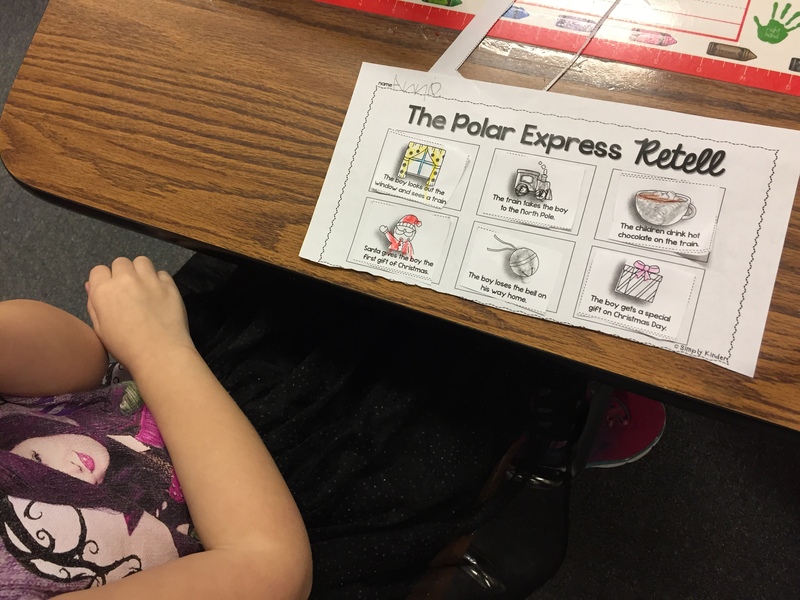 Students describe him using the Polar Express as an example as well as other Christmas related stories. 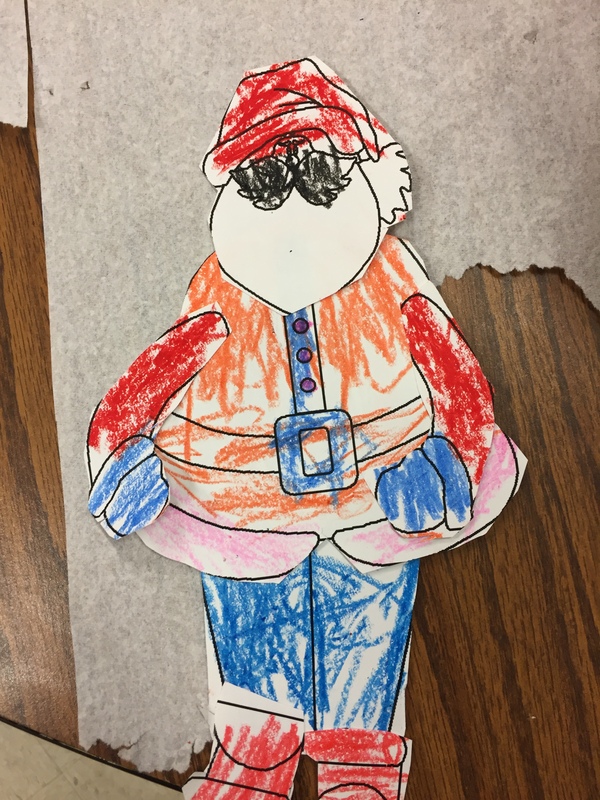 Students were able to describe how he was kind, giving, jolly, and friendly. 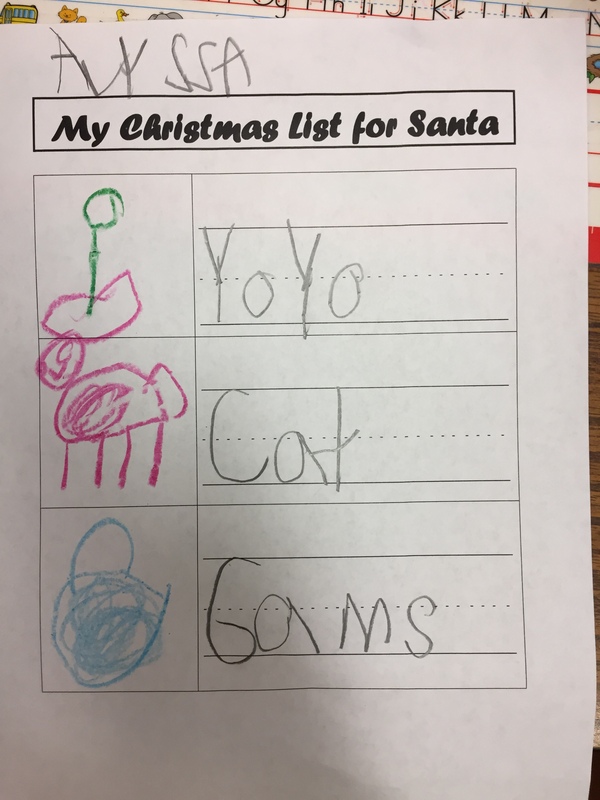 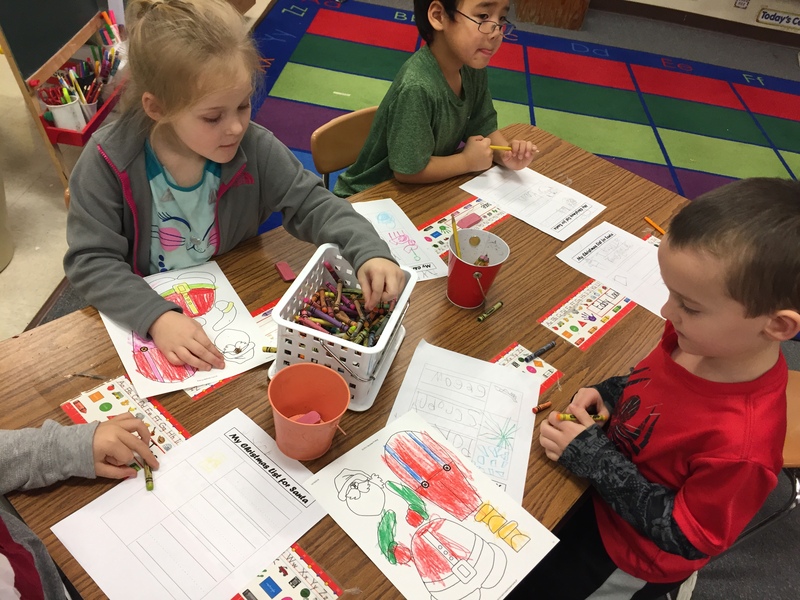 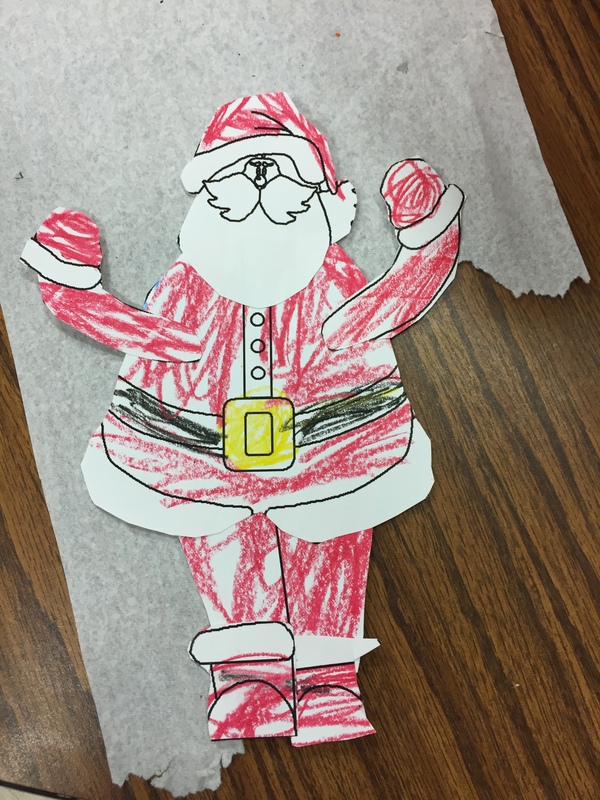 Then they wrote their Christmas lists and created their own Santa art. 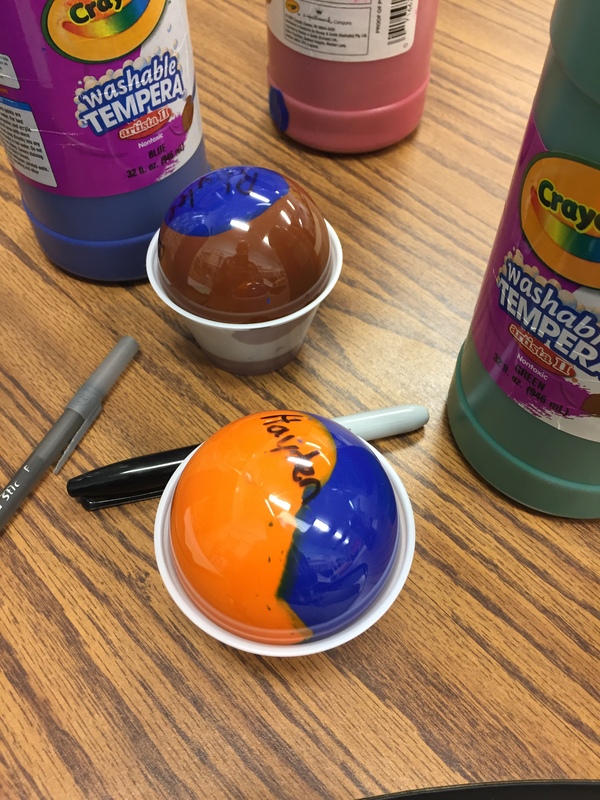 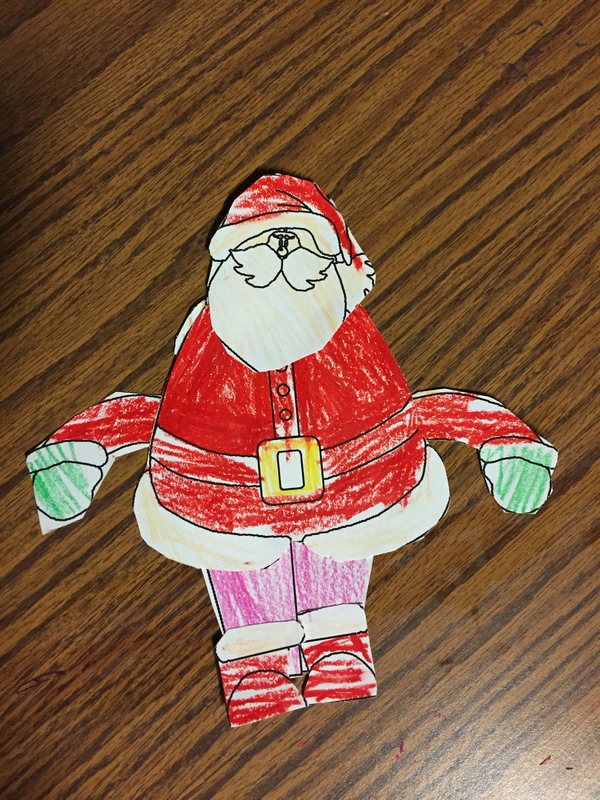 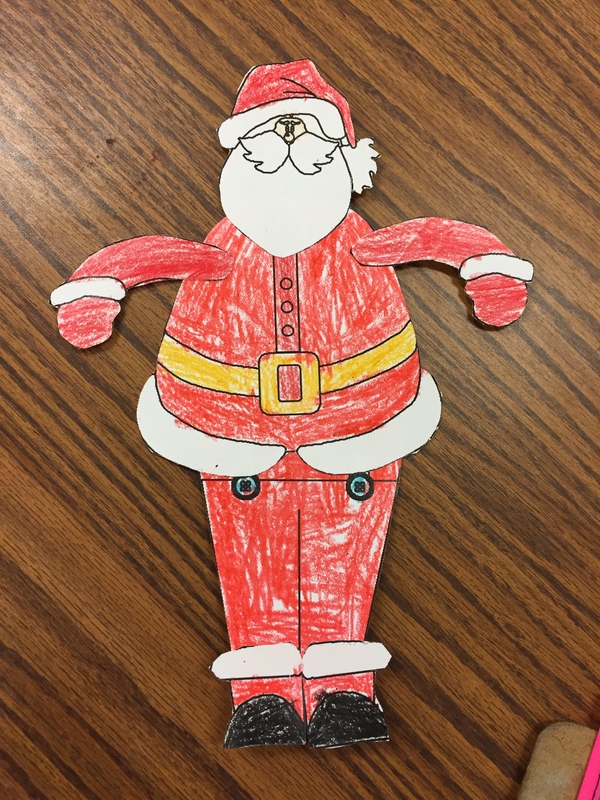 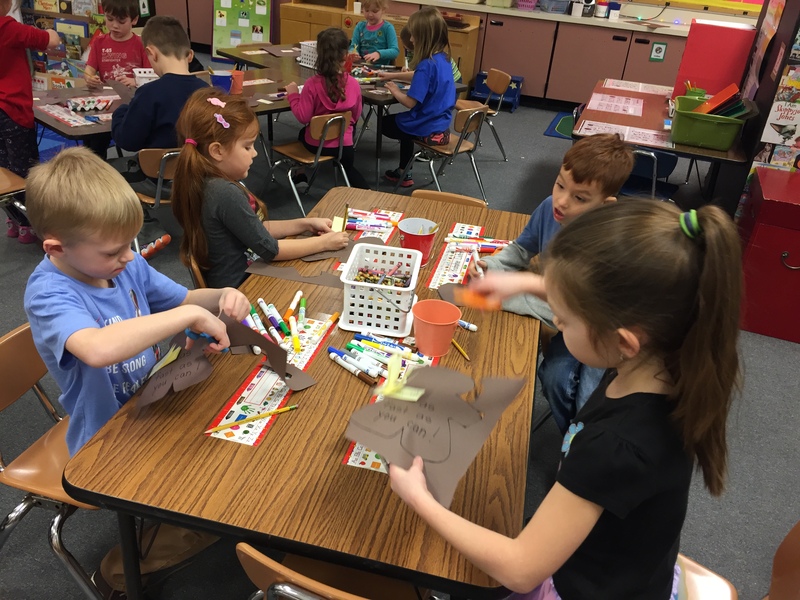 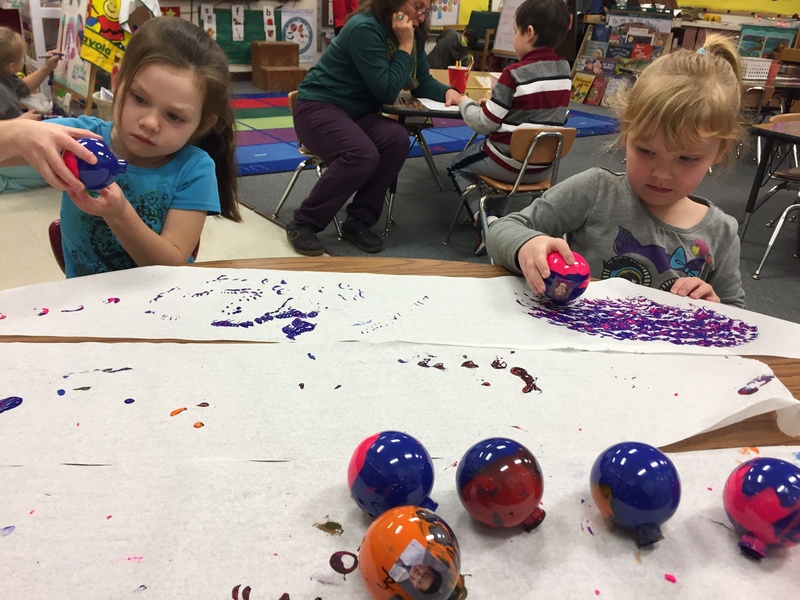 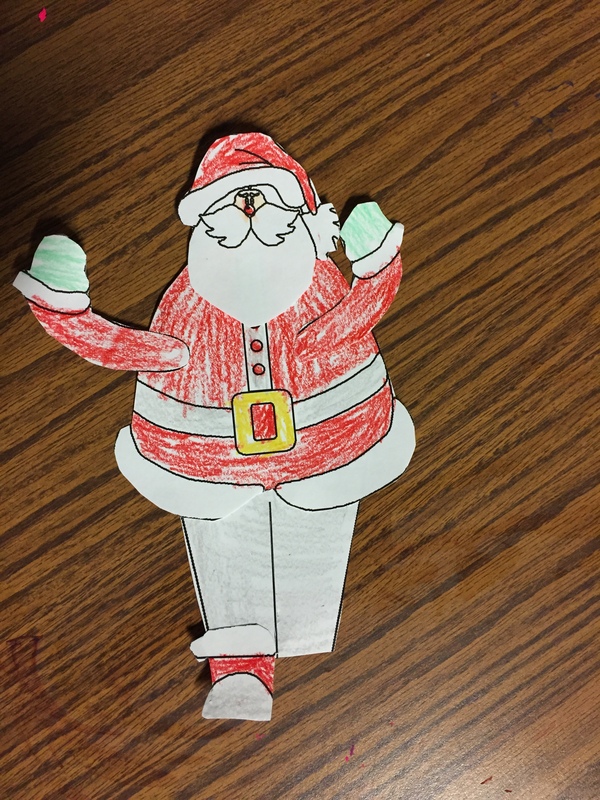 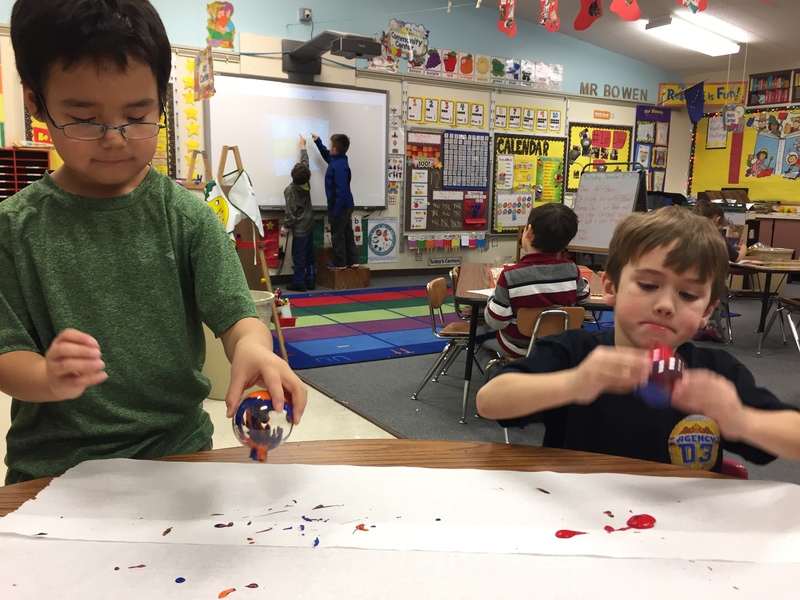 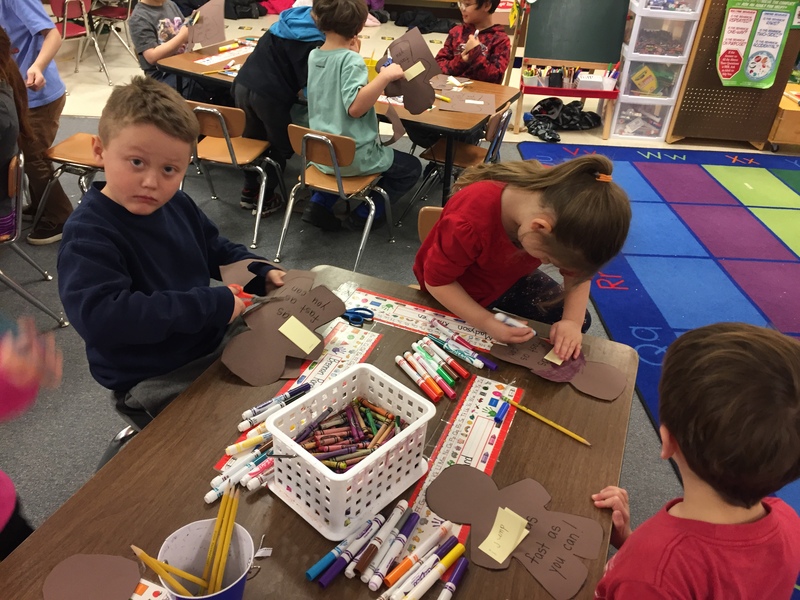 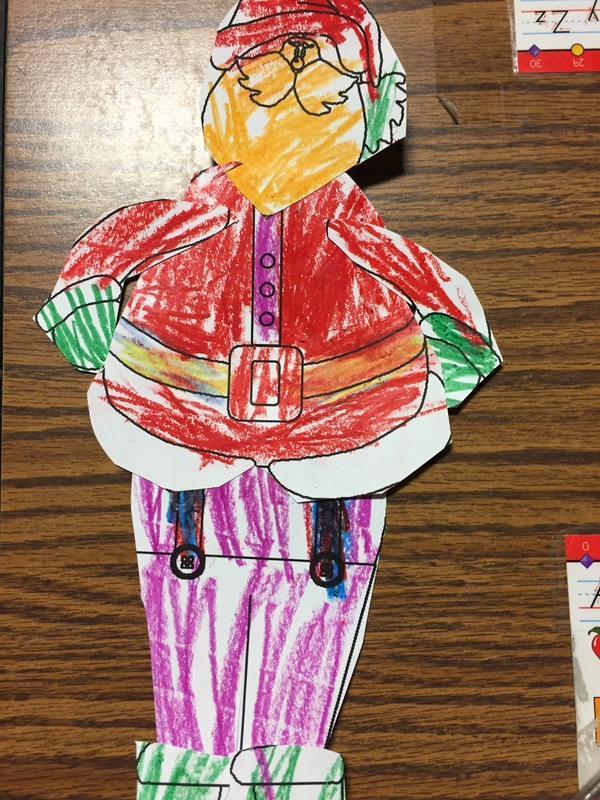 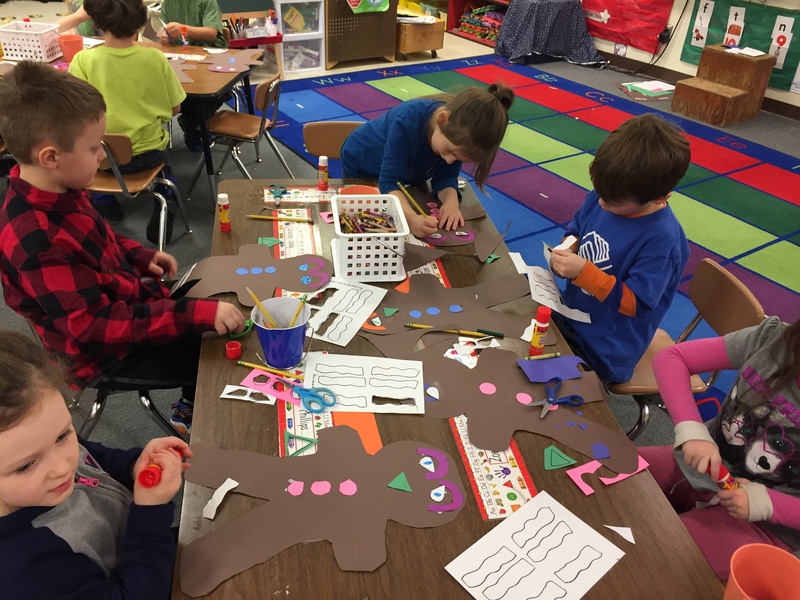 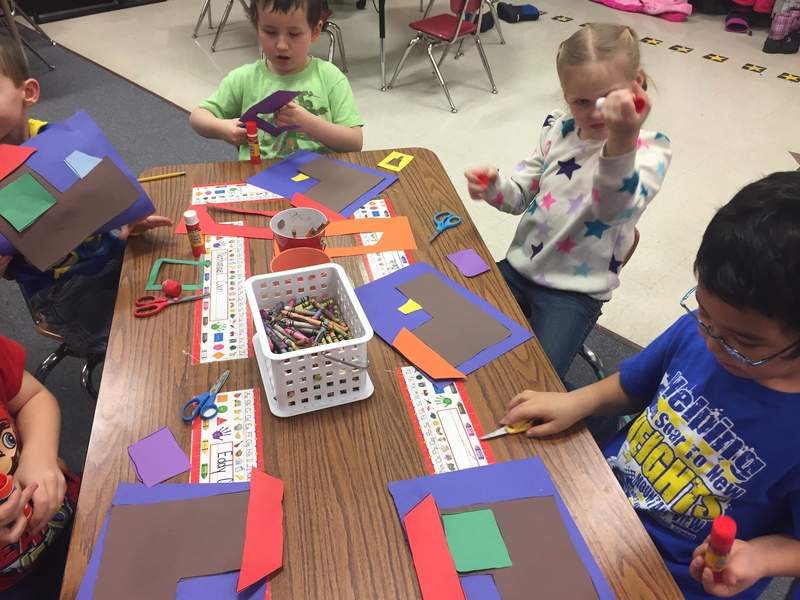 To be like Santa students also began making Christmas ornament presents for their friends and family. 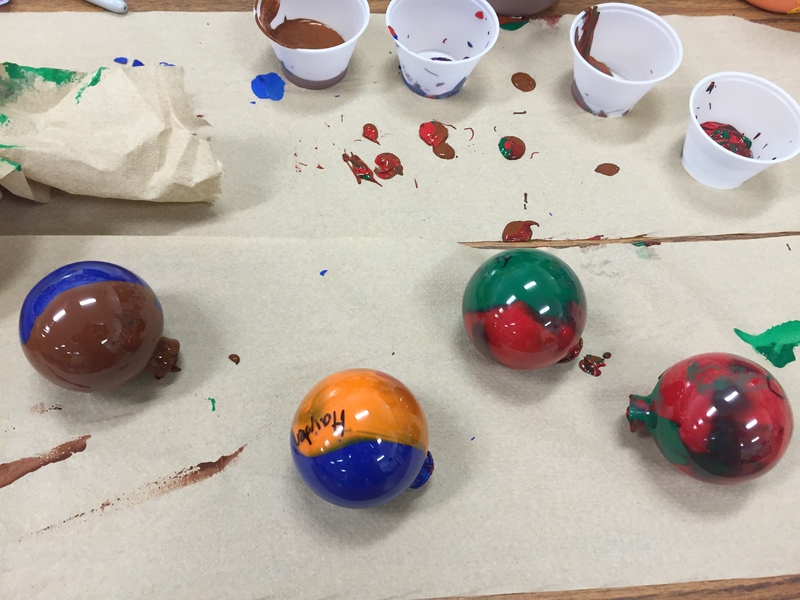 They took clear ornaments and put two different colors of paint and swirled them around to make a marble effect. 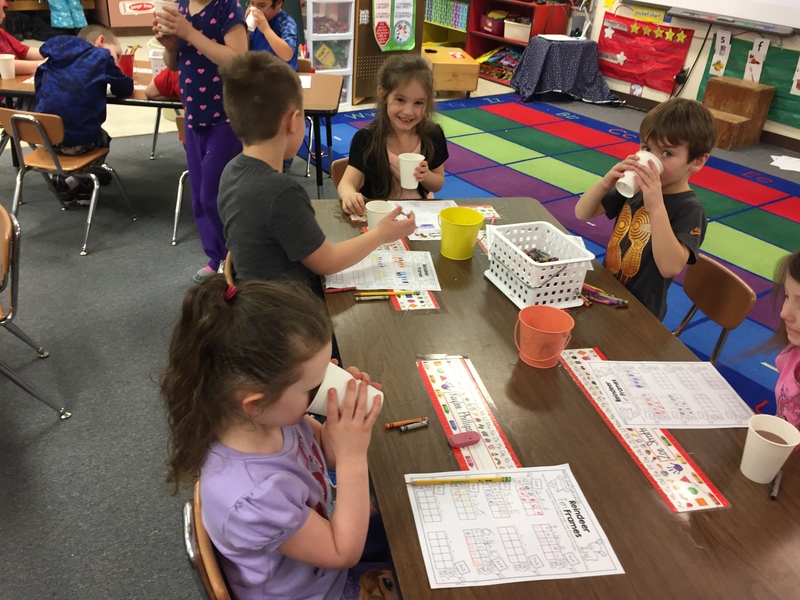 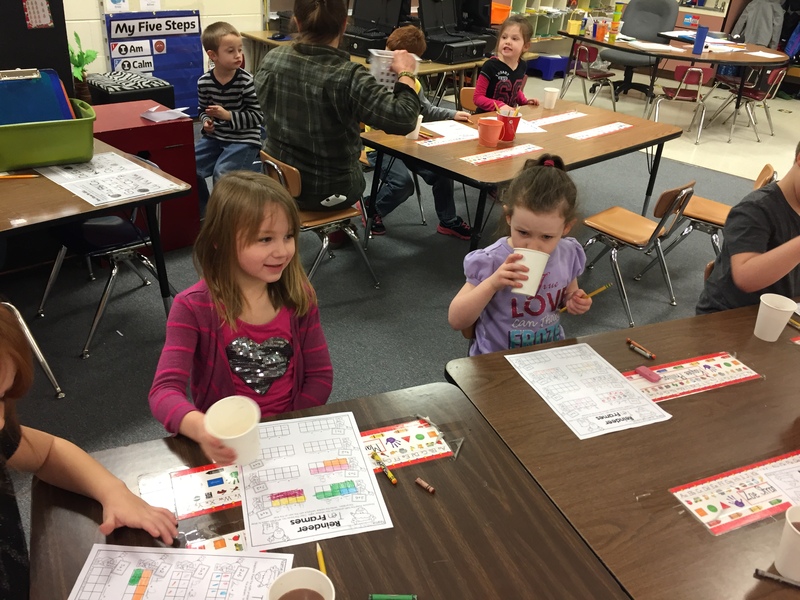 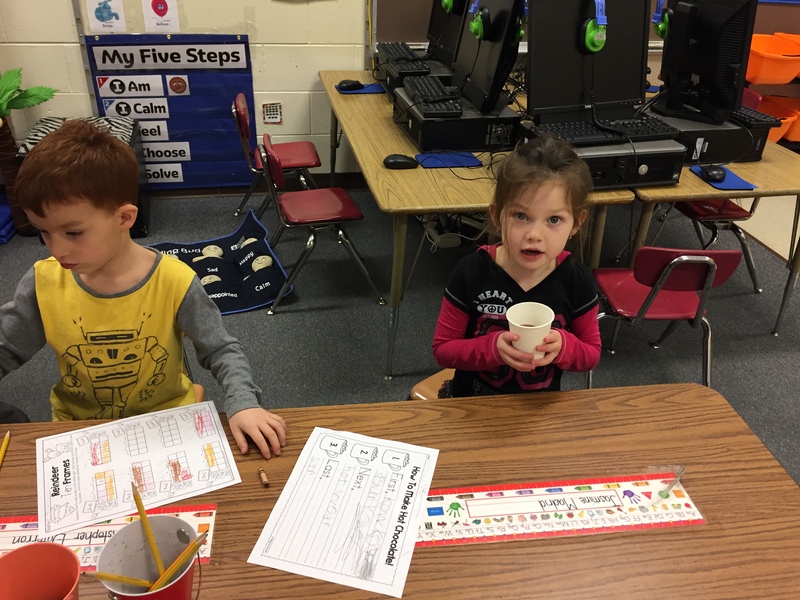 As part of our Polar Express week students got to try out hot chocolate before our Polar Express Day. 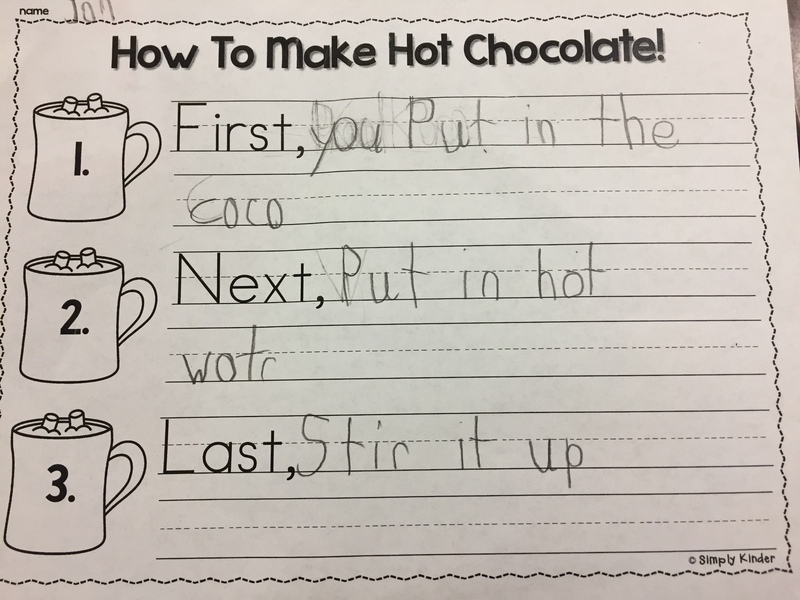 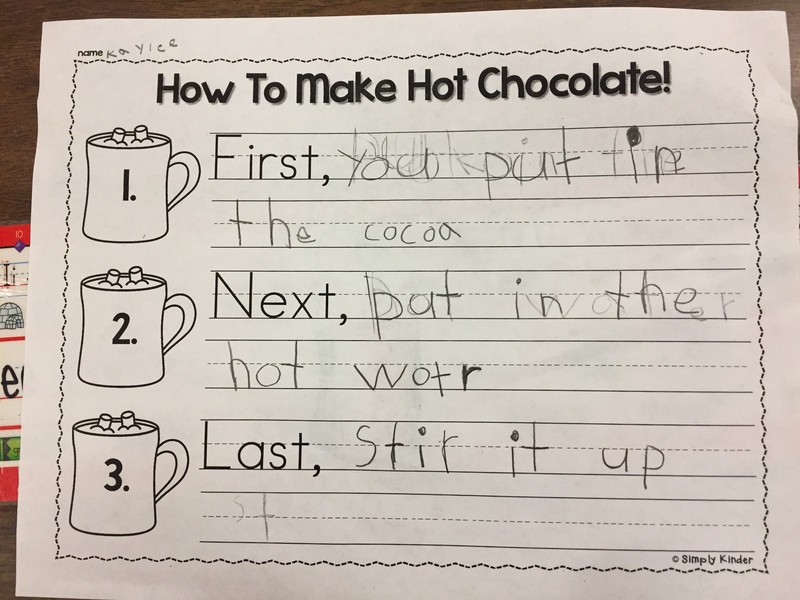 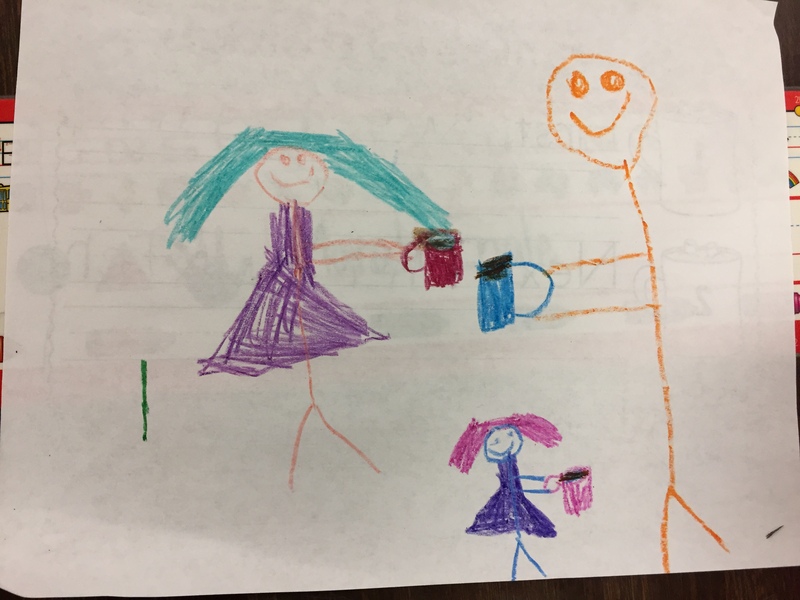 I showed students how to make hot chocolate and they wrote 3 step directions on how to make it. 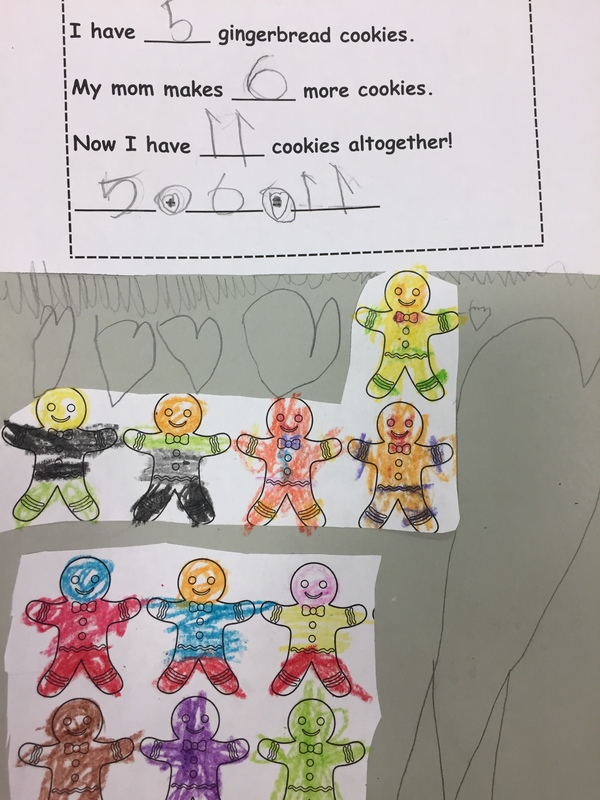 Students also drew pictures on the back of the directions. 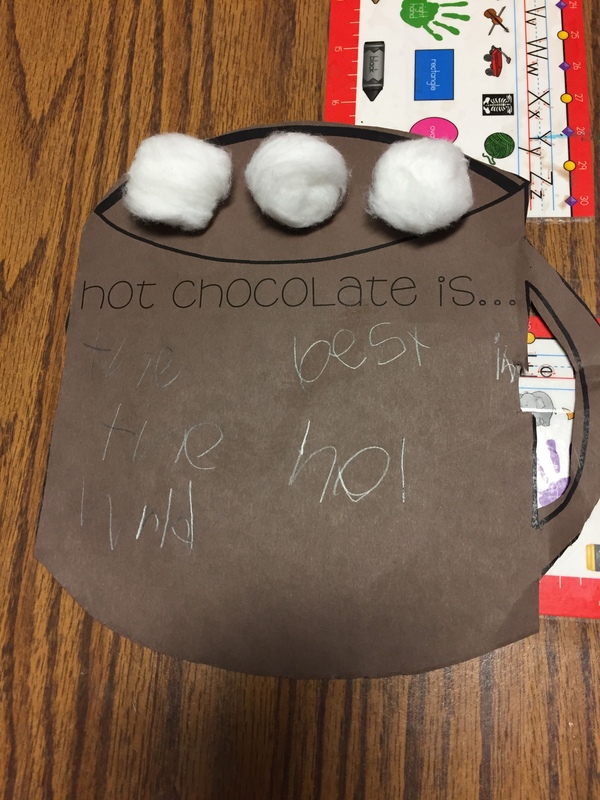 Students got to sample the hot chocolate and then we made a class graph on if the class liked hot chocolate or not. 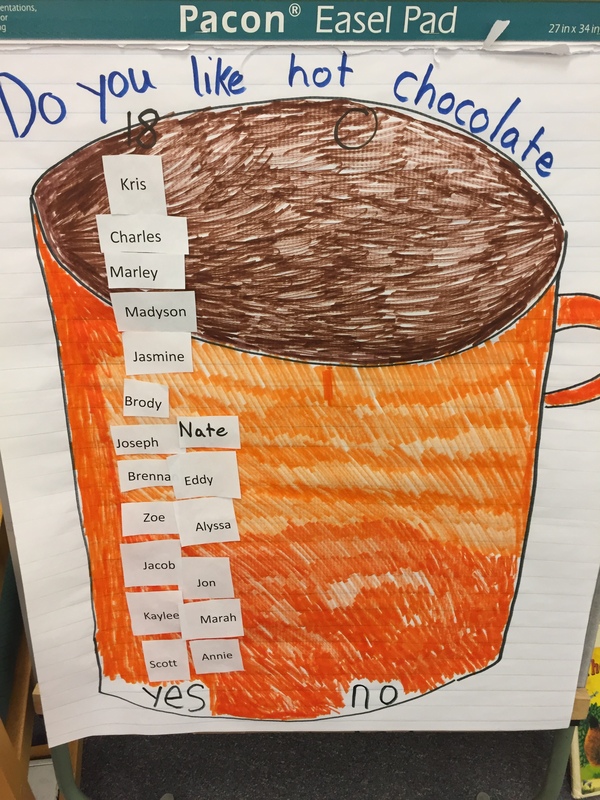 It was a very lopsided graph since everyone said the liked hot chocolate! 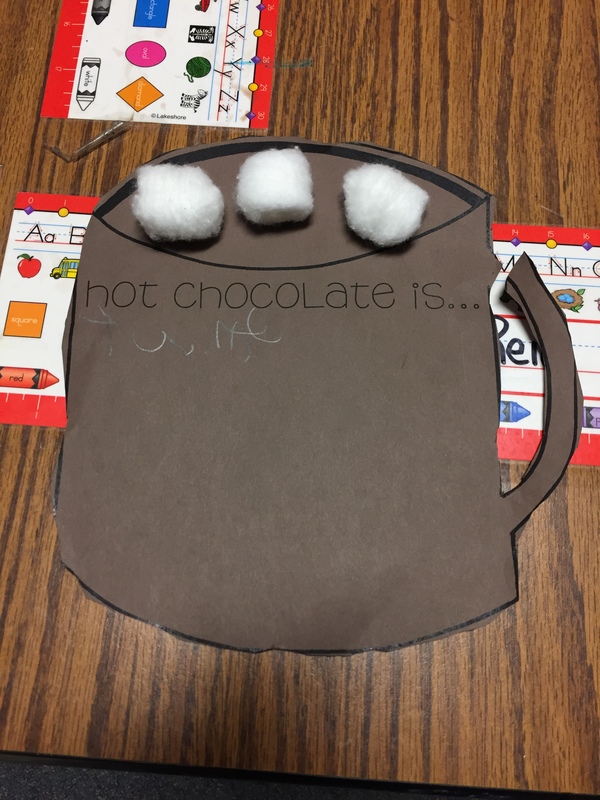 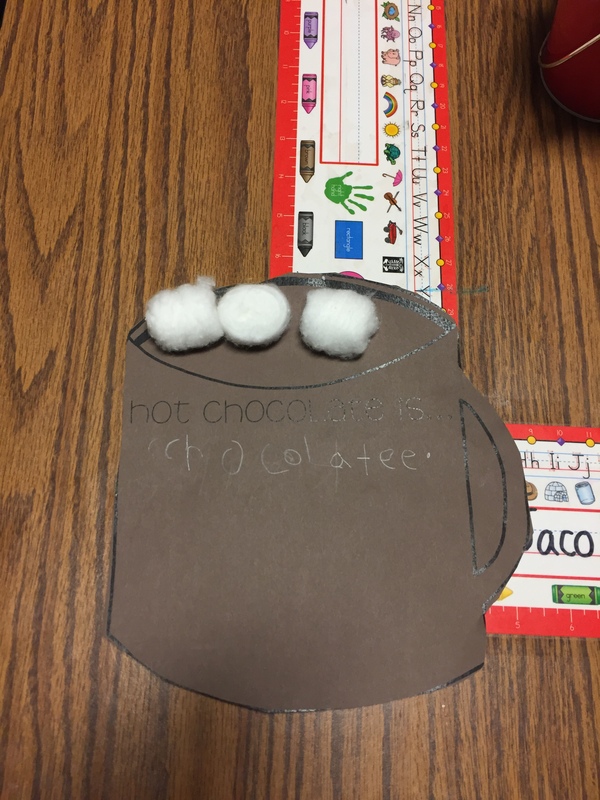 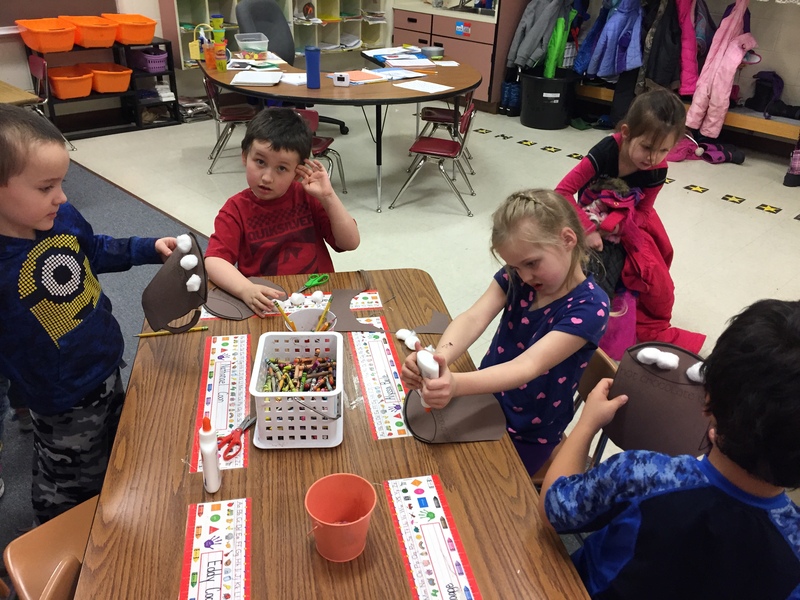 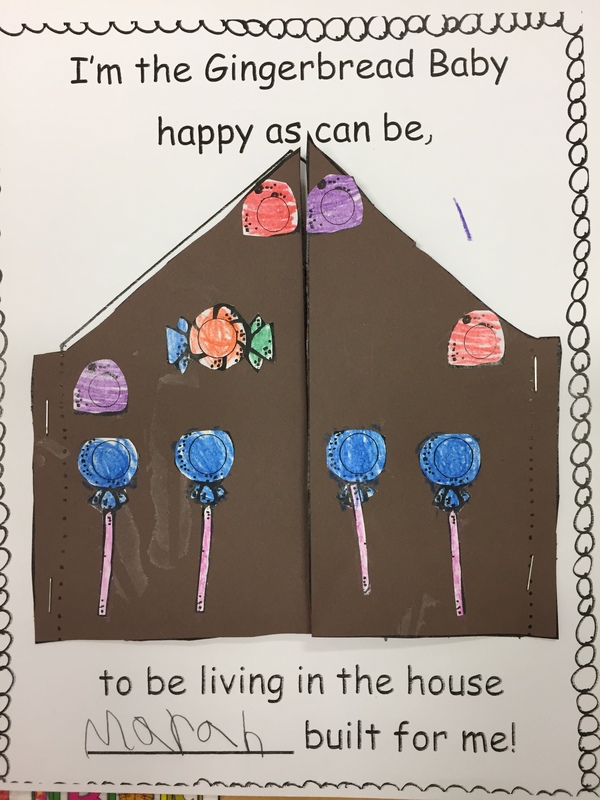 At the end students cut out a cup of hot chocolate on construction paper and wrote about what they thought hot chocolate is. 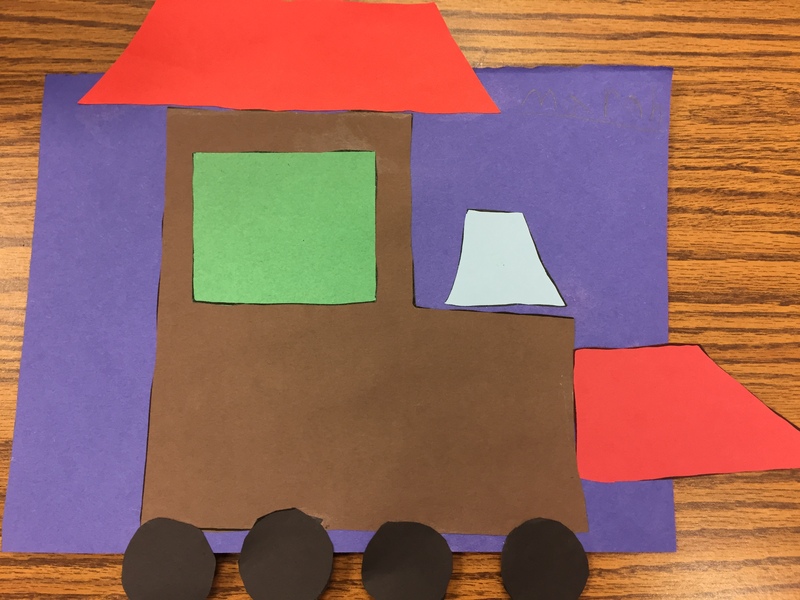 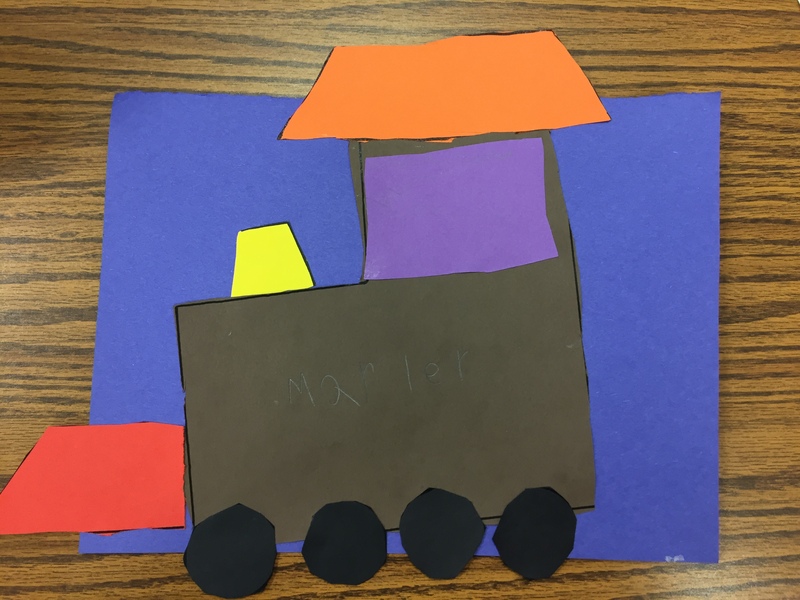 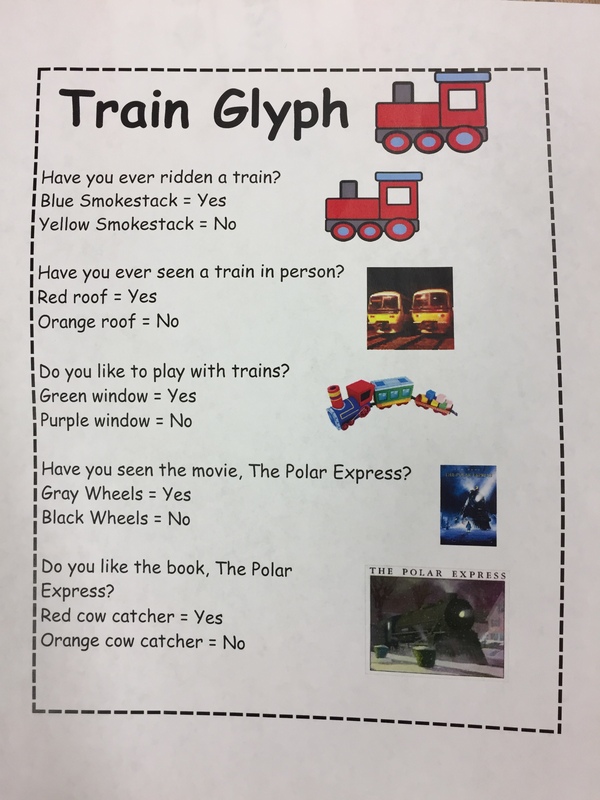 For the second day of Polar Express week, students made glyphs based on questions about trains and Polar Express. 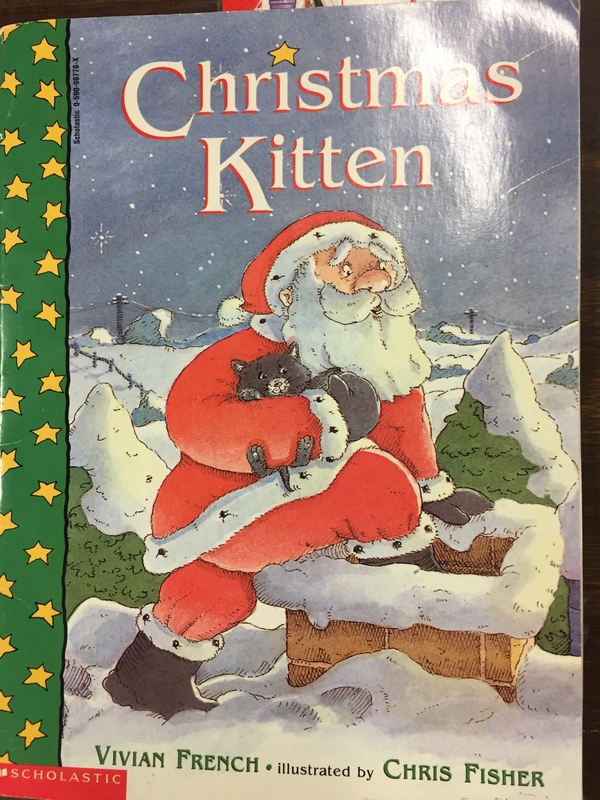 Then we read the story Christmas Kitten by Vivian French. 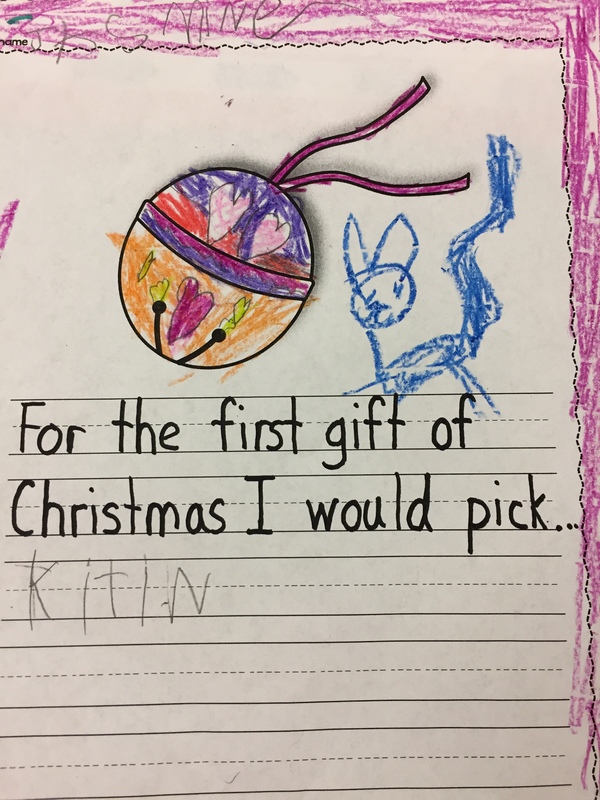 We talked about how the girl in the story really wanted a kitten for Christmas, and how the boy in The Polar Express got the bell he really wanted as the first gift of Christmas. 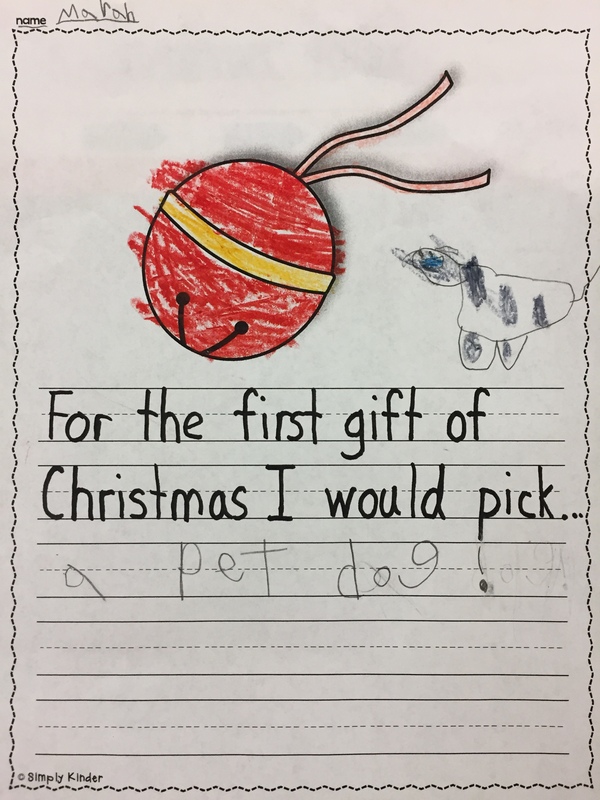 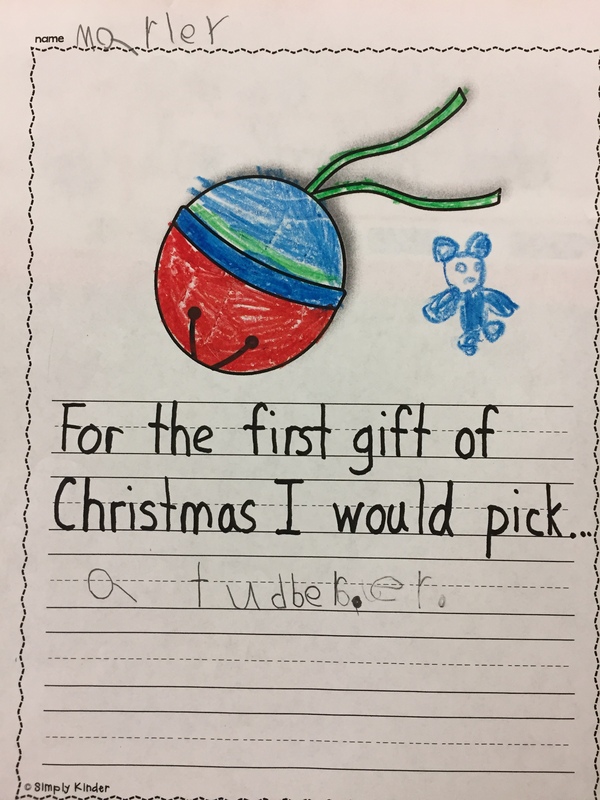 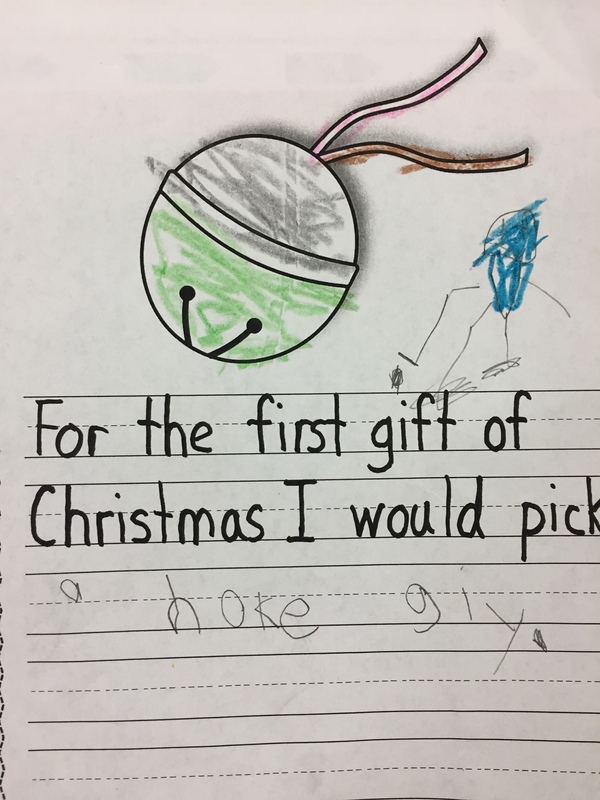 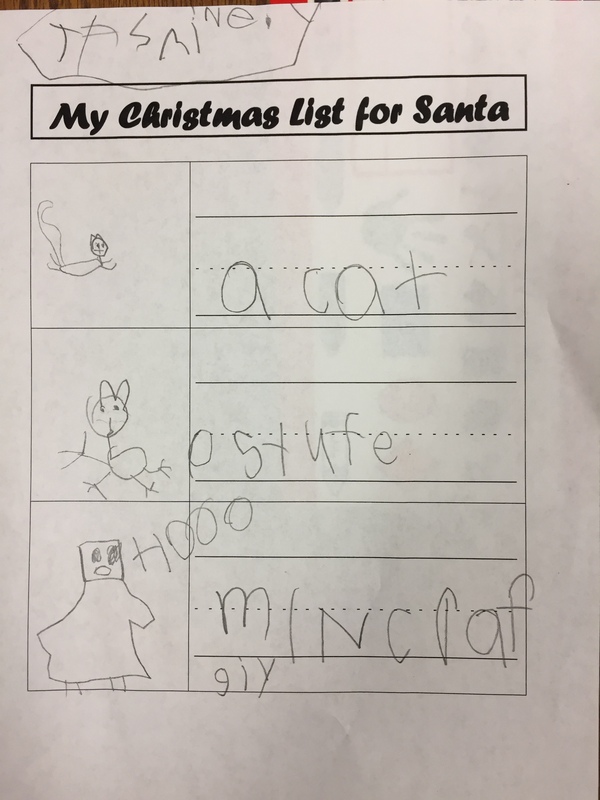 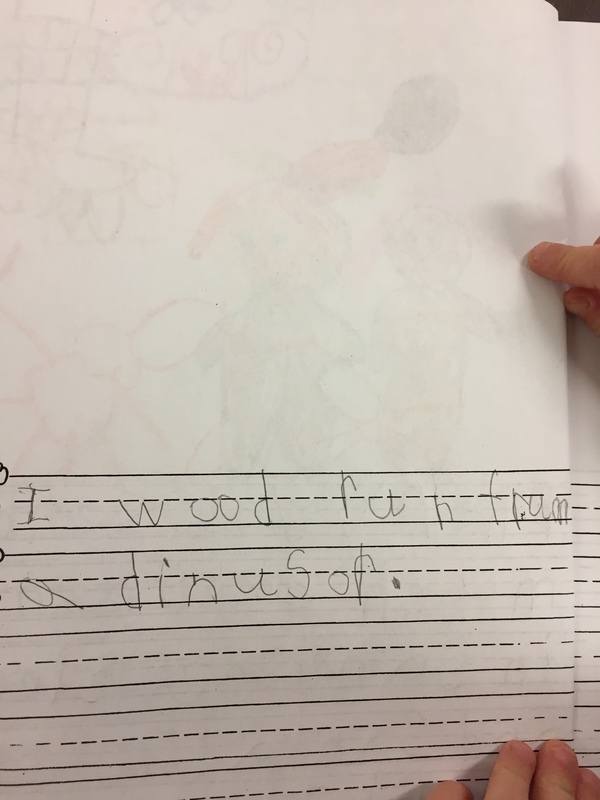 We then wrote about what we would pick for the first gift of Christmas. 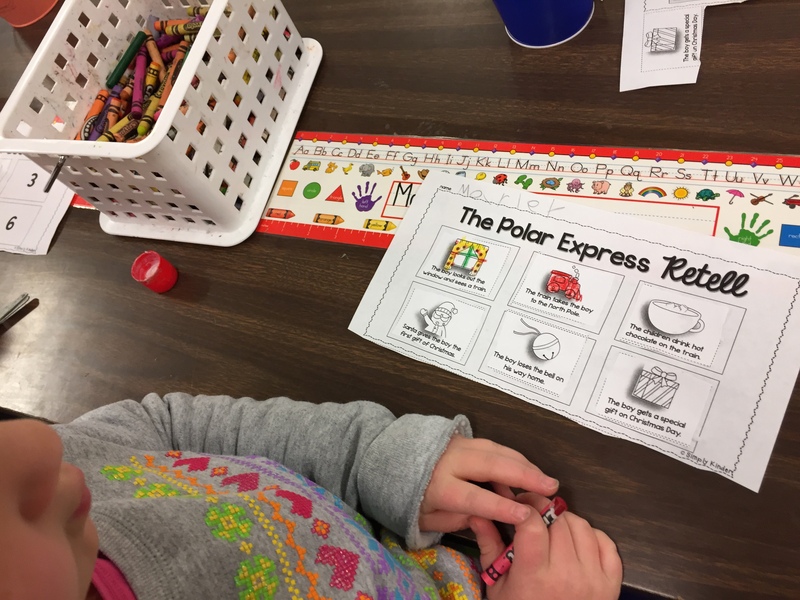 This week is Polar Express week! 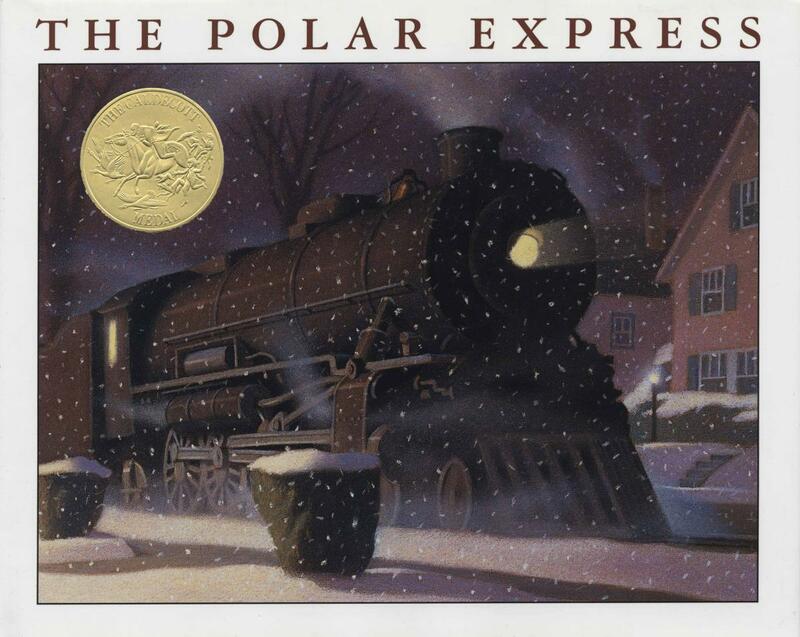 We started the week with reading the book Polar Express by Christ Van Allsburg. 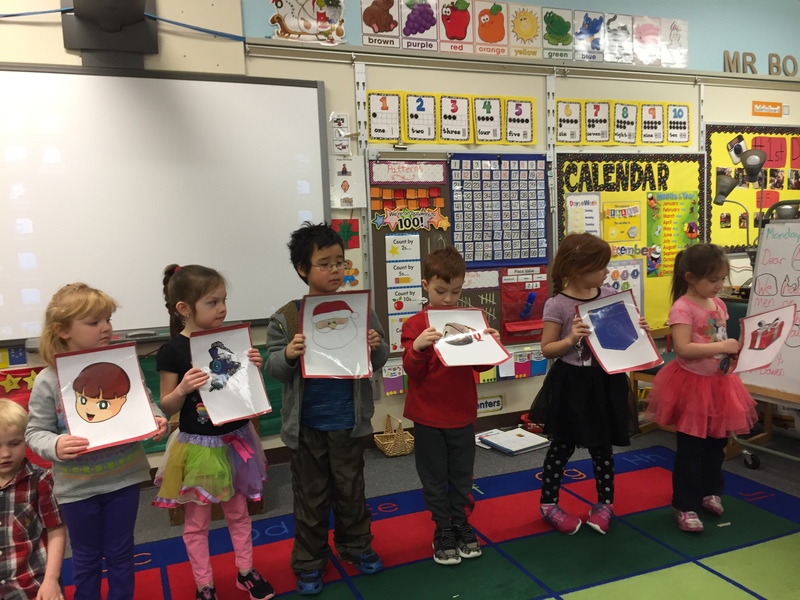 After we read the story we retold the story with sequence cards by putting the cards in the correct order. 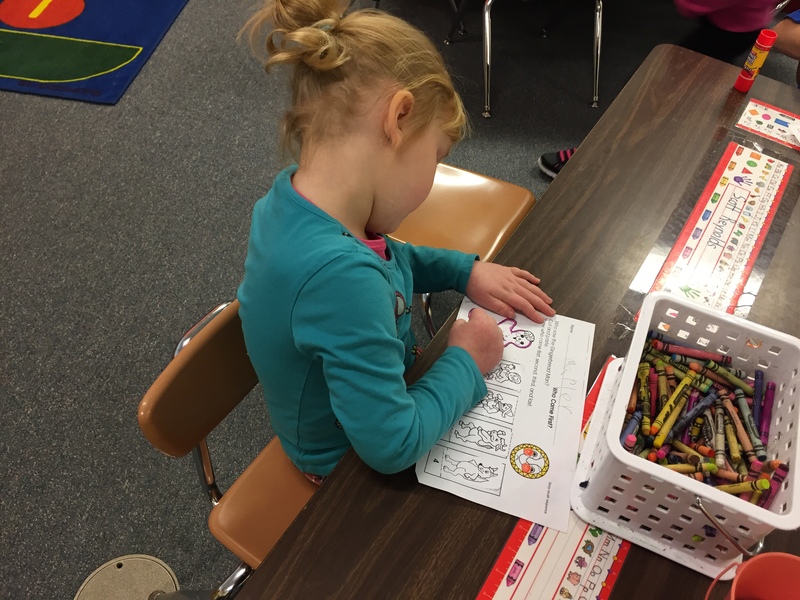 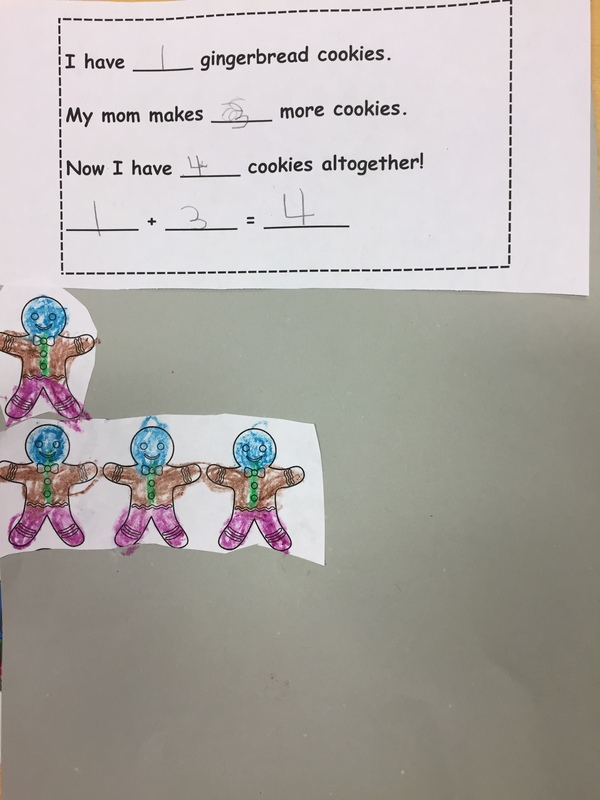 Then students completed a cut and paste activity to retell the sequence of their story. 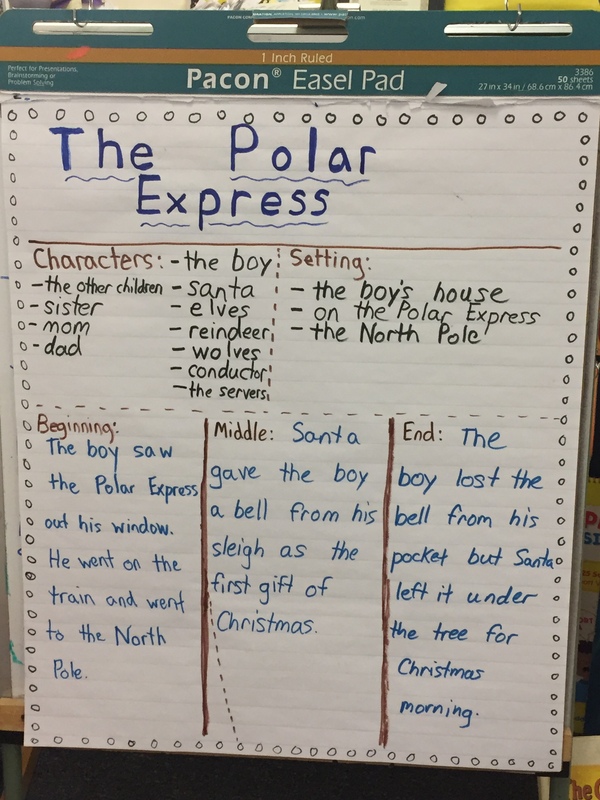 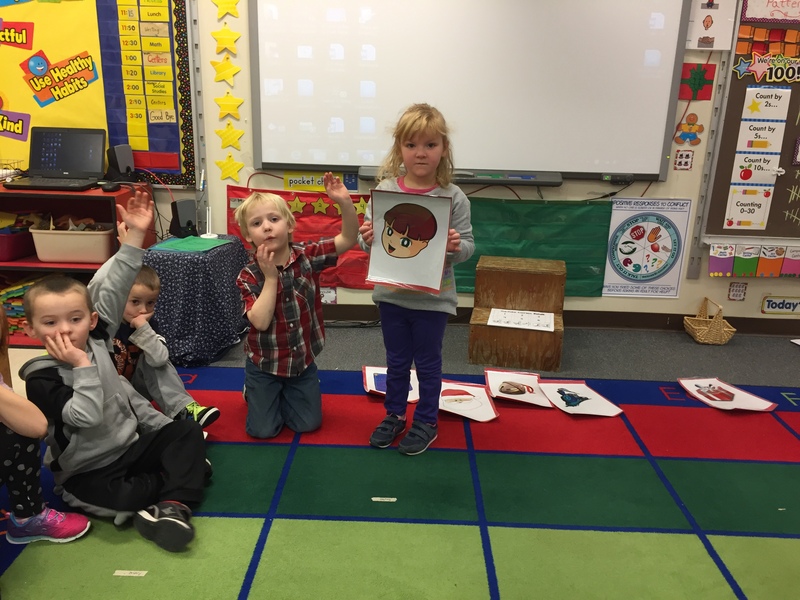 Polar Express retell came from Simply Kinder. 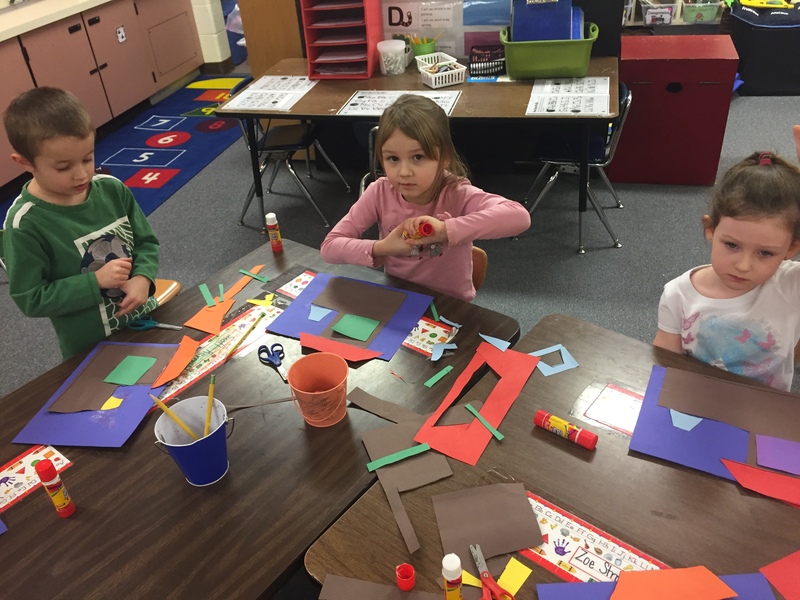 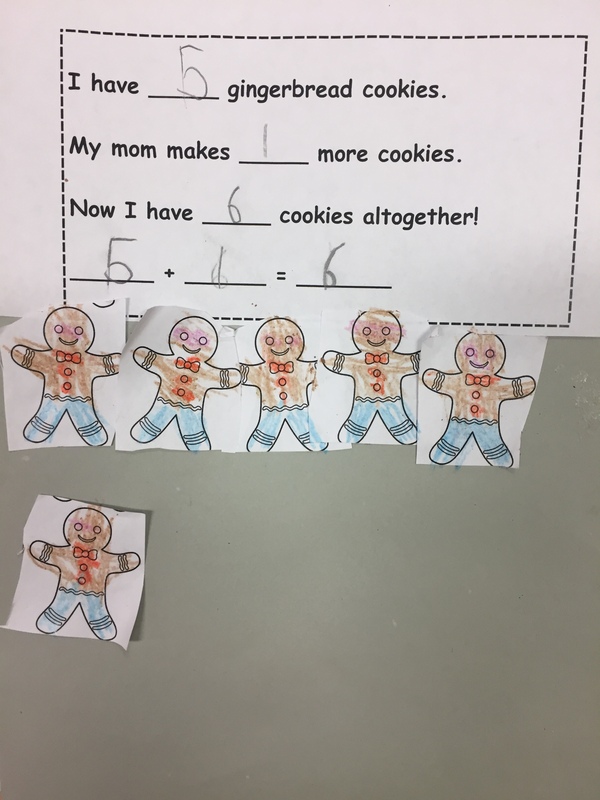 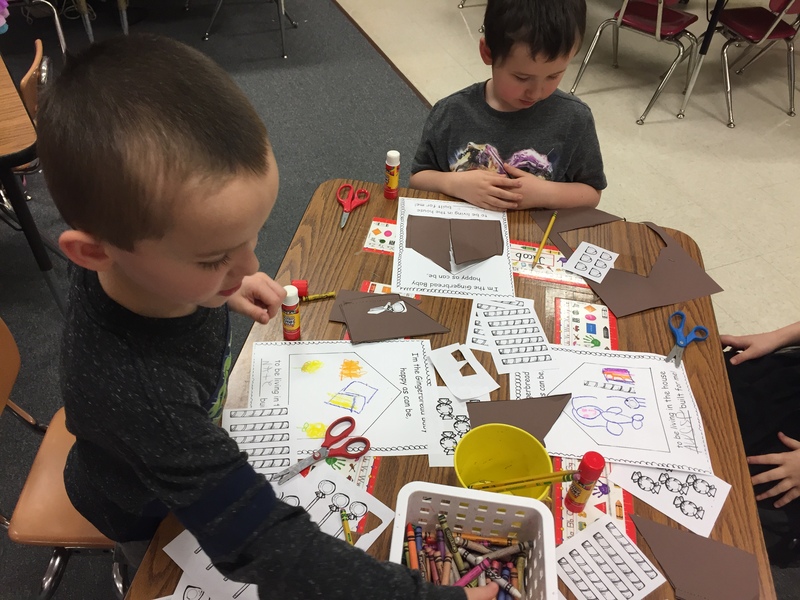 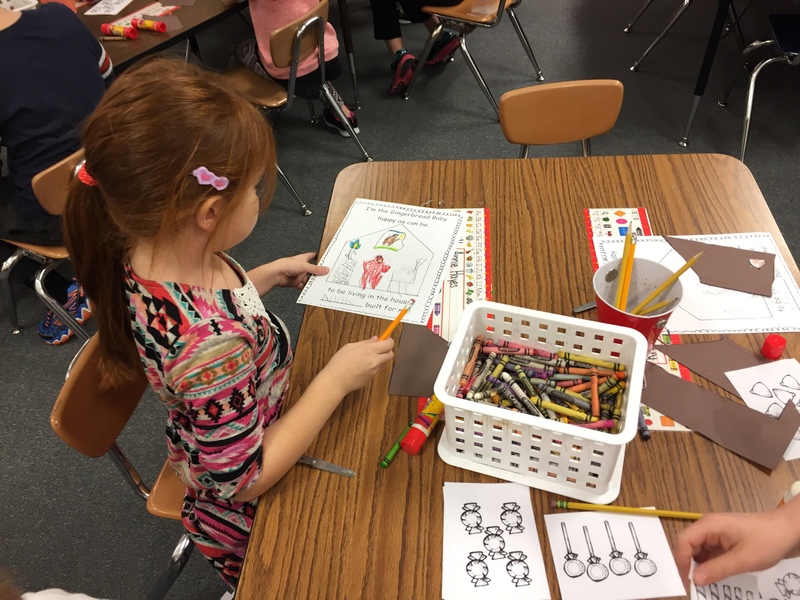 As we continued on with our gingerbread unit we completed math addition story problems about gingerbread men. 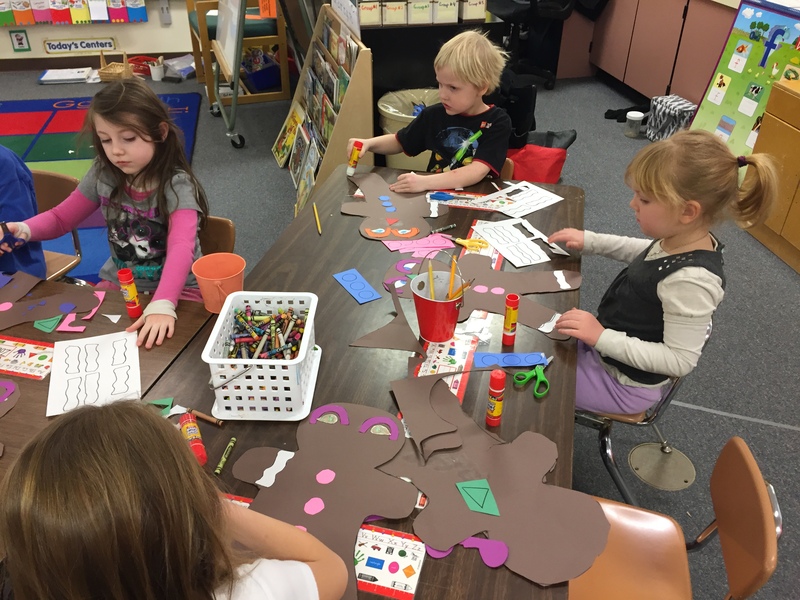 We also made gingerbread men glyph. 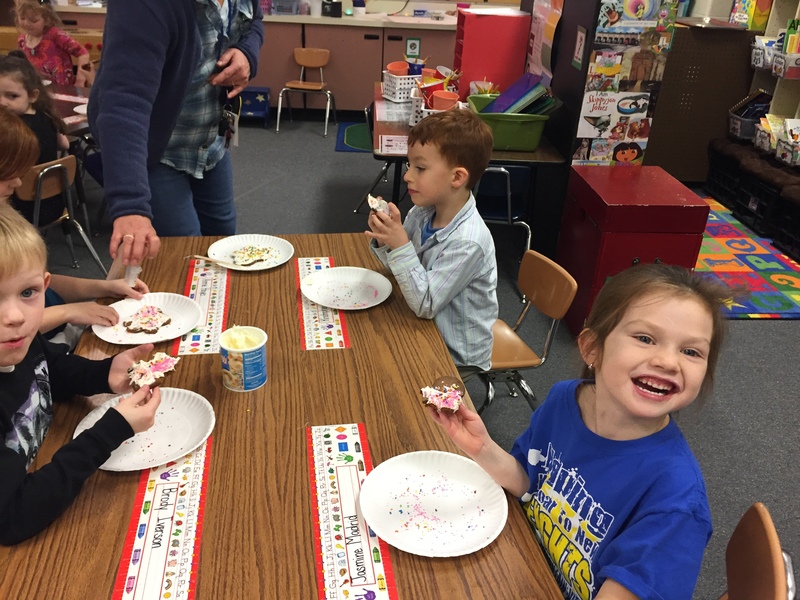 Finally we made / ate our own gingerbread cookies and decorated them with frosting and sprinkles. 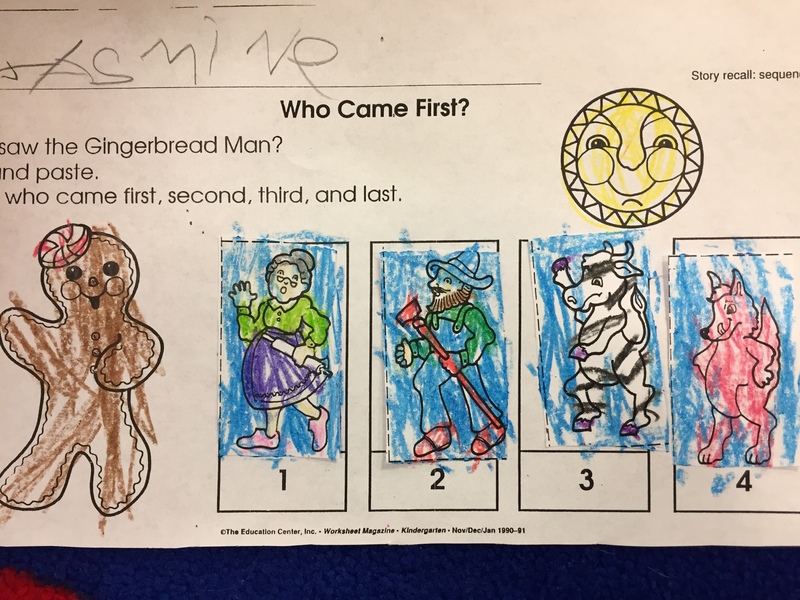 This week we began our unit on gingerbread. 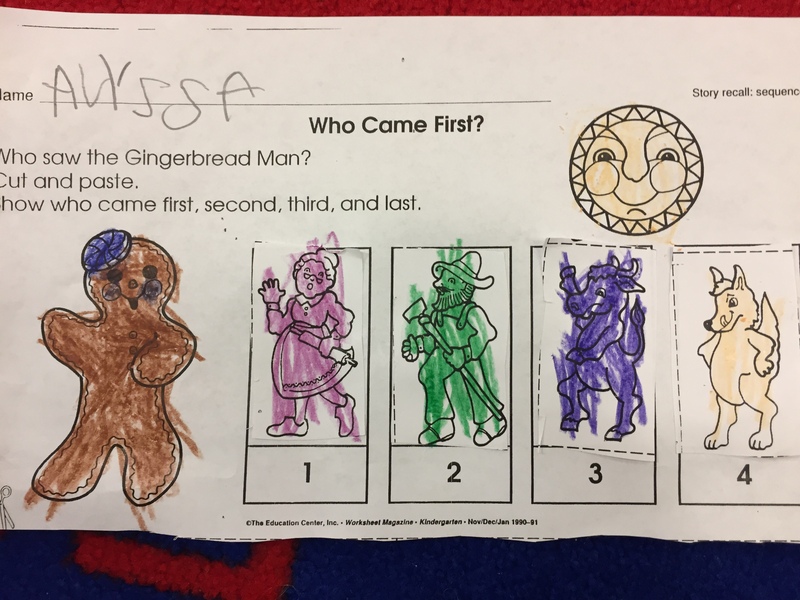 In this unit we read many different versions of the gingerbread man folktale. 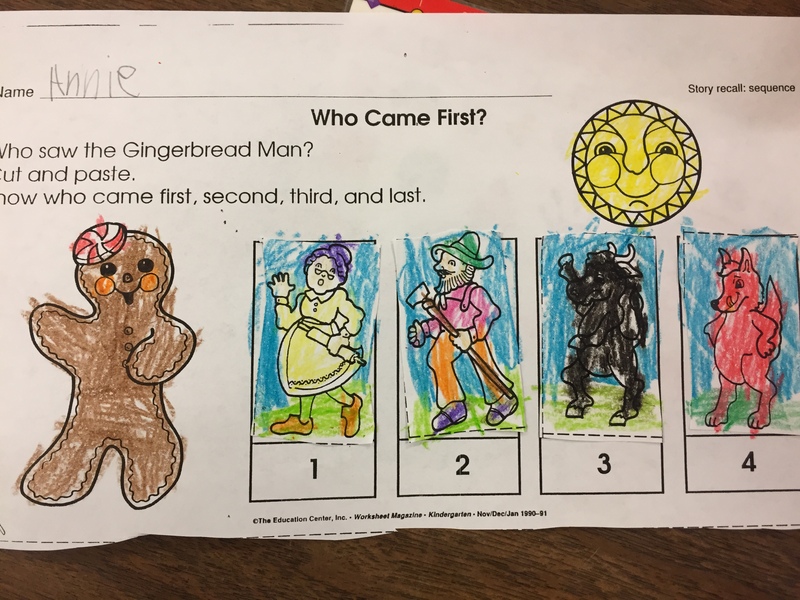 We started by reading a version that resembles original Gingerbread Man story. 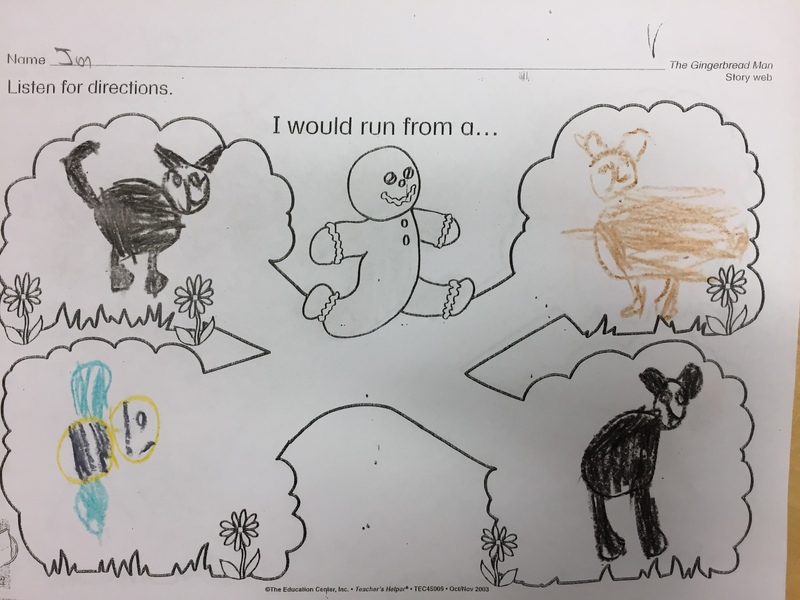 We did a retell of the story by doing a sequence cut and paste. 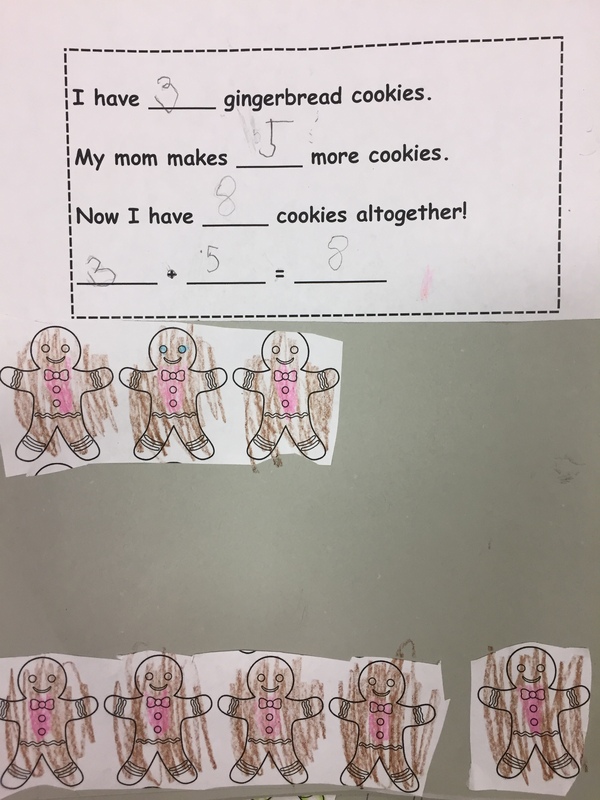 Then we made our own gingerbread men and write action words to complete a phrase. 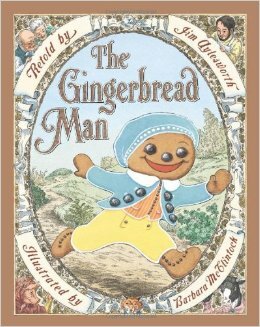 The next day we read another version called Gingerbread Baby by Jan Brett. 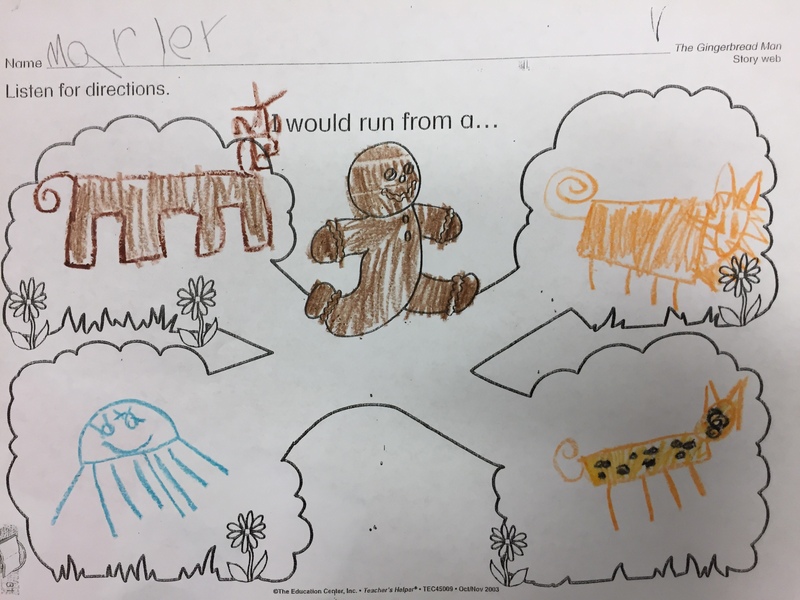 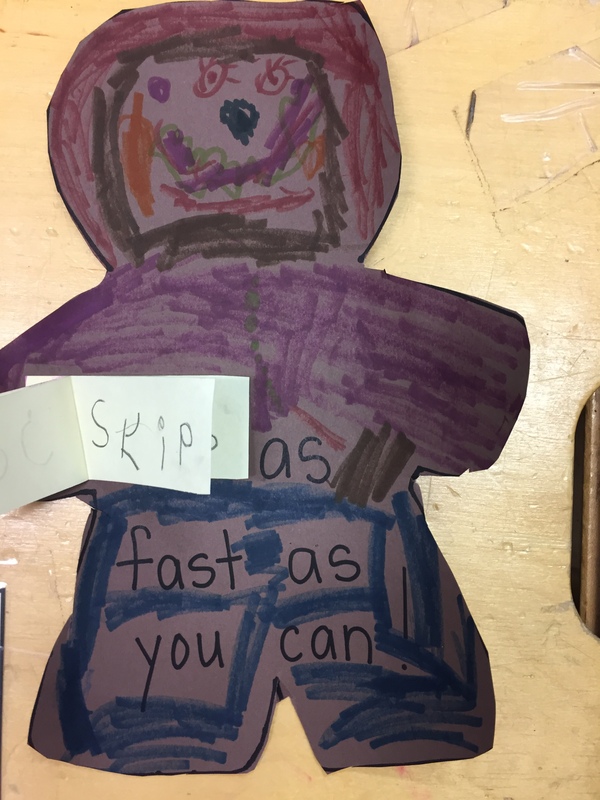 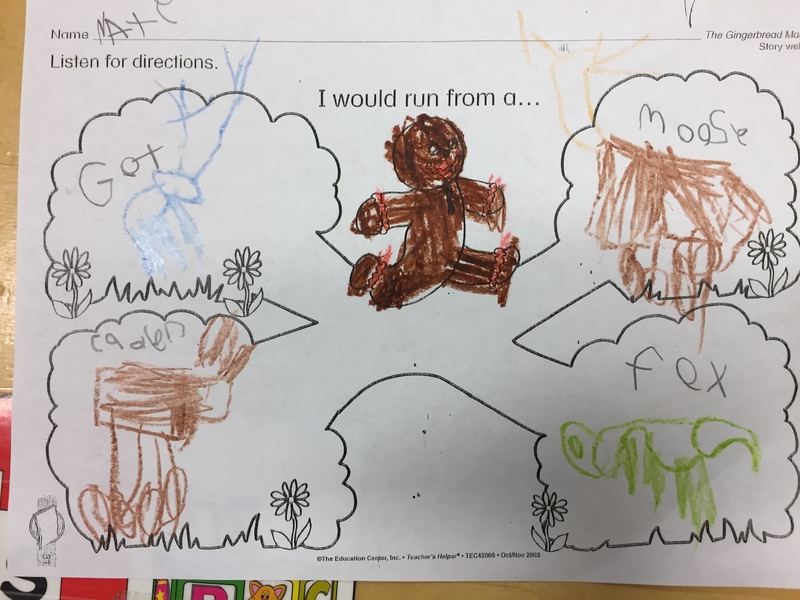 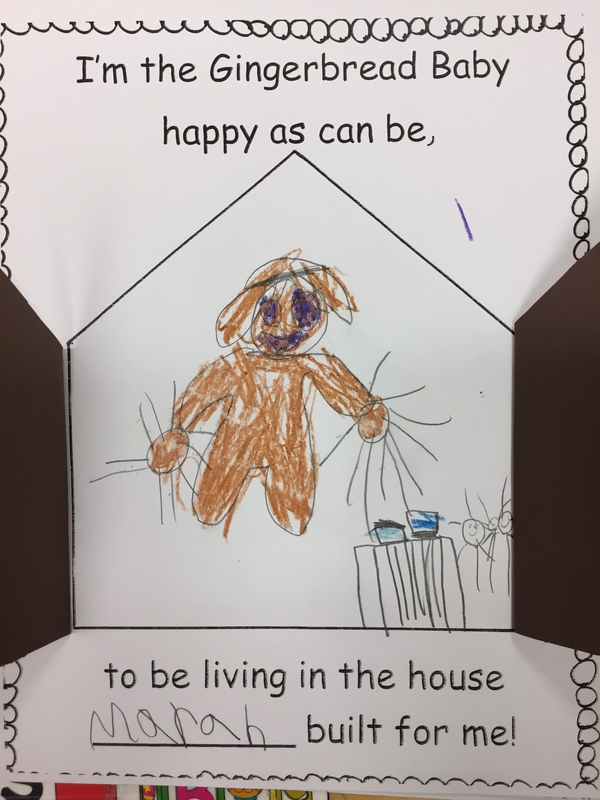 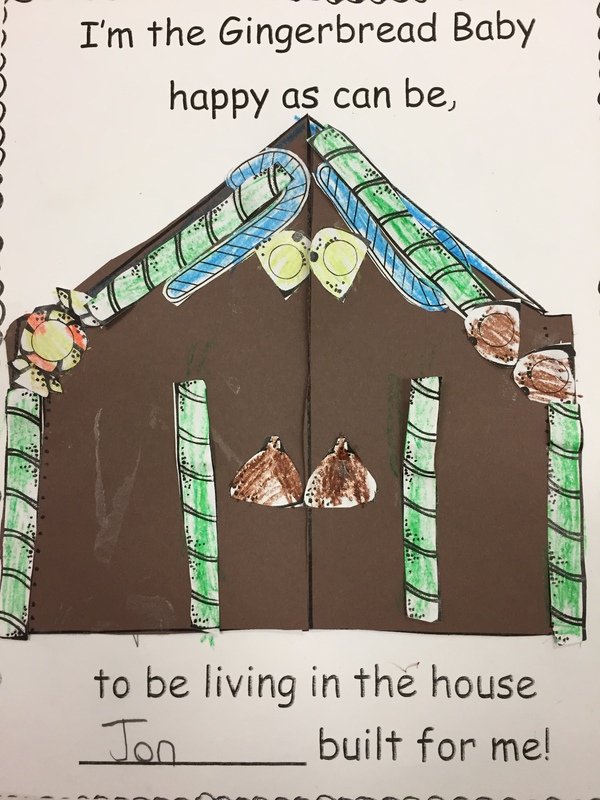 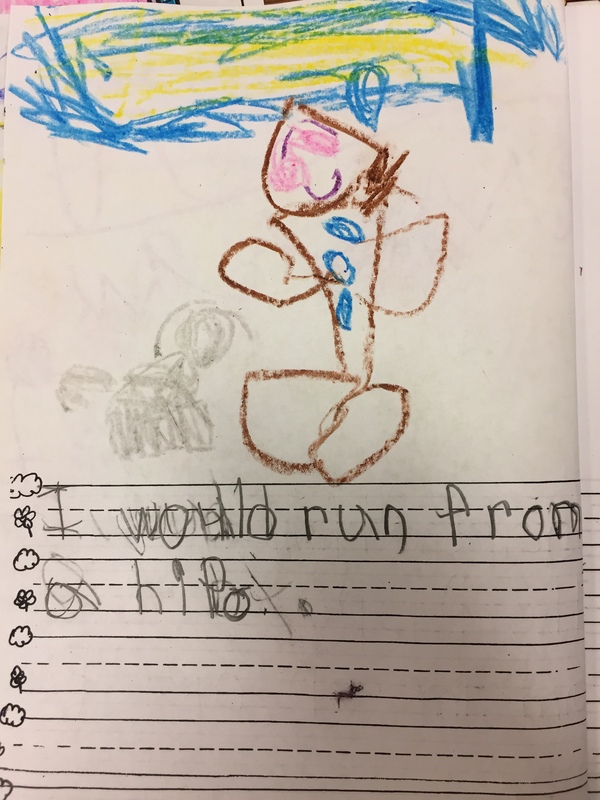 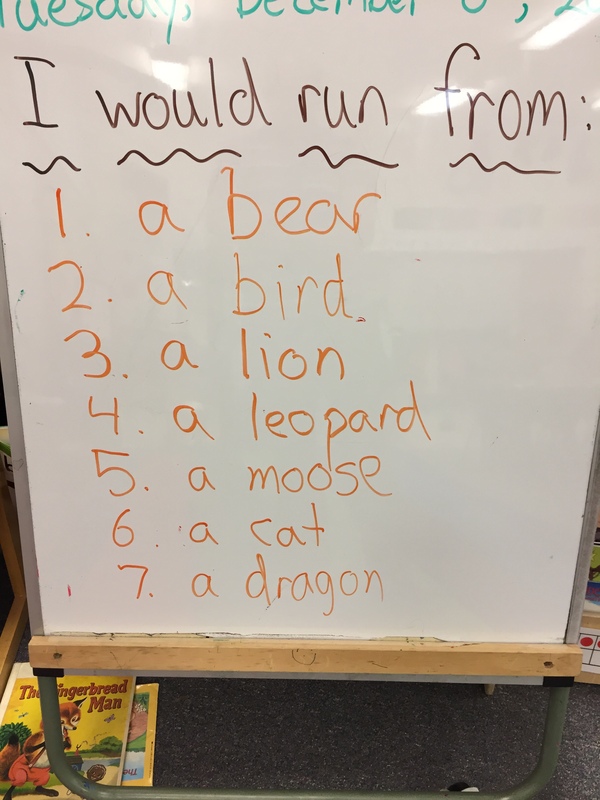 Students made a list of things that they would run away from if they were the gingerbread baby and wrote about it in their journals. 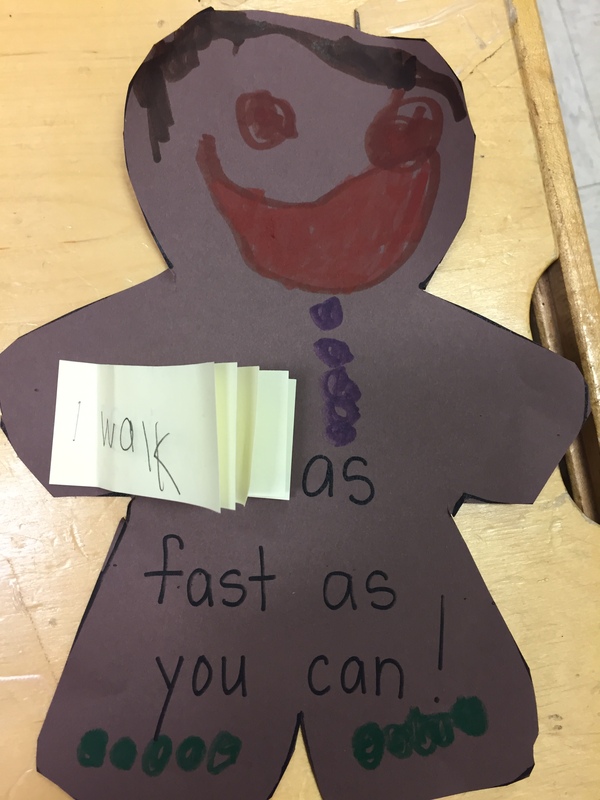 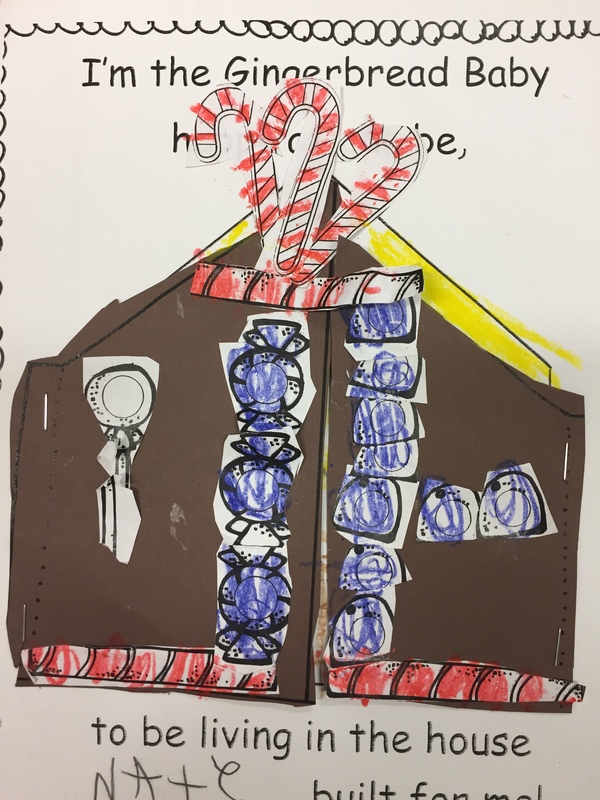 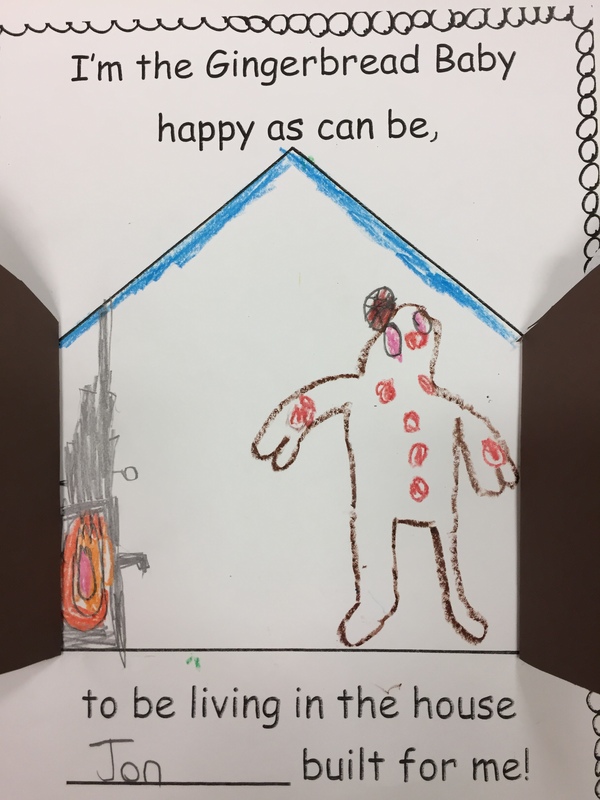 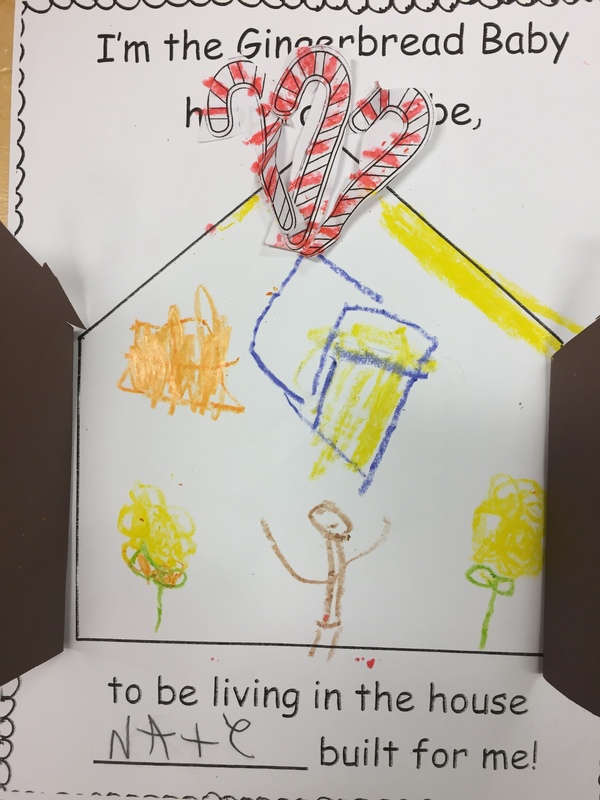 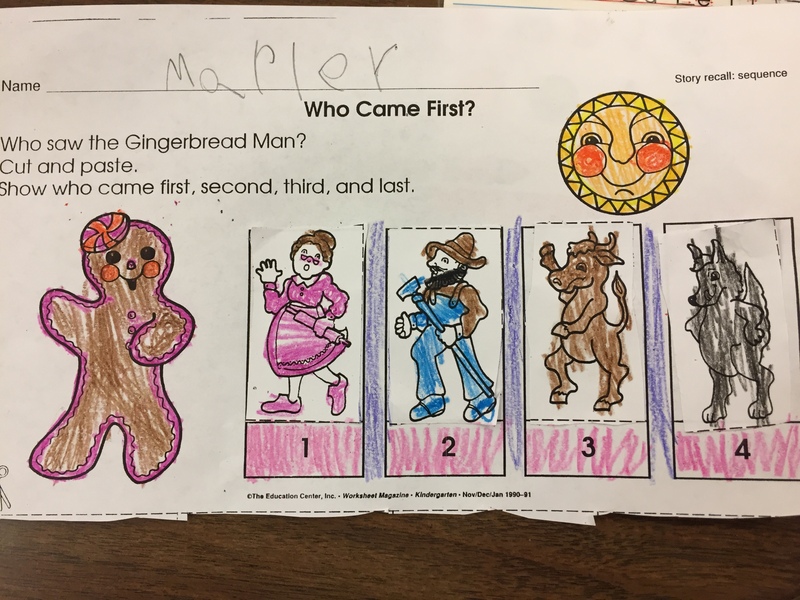 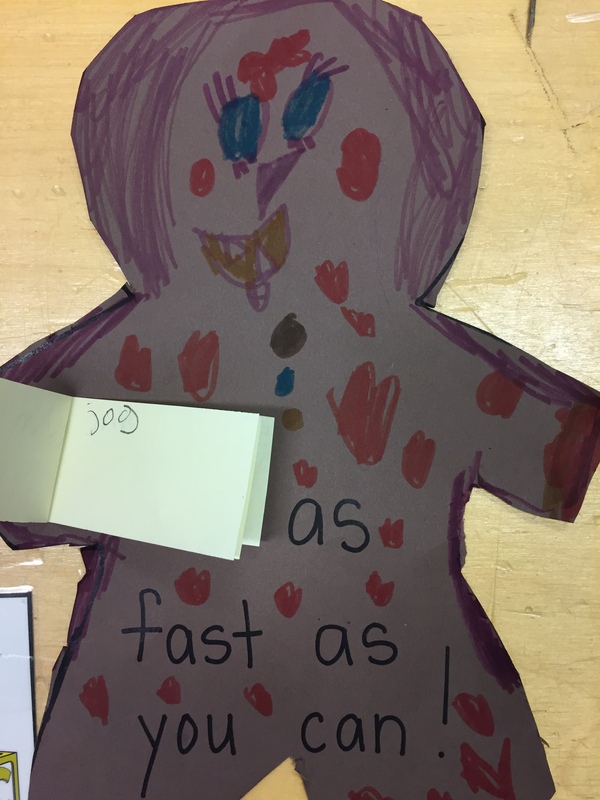 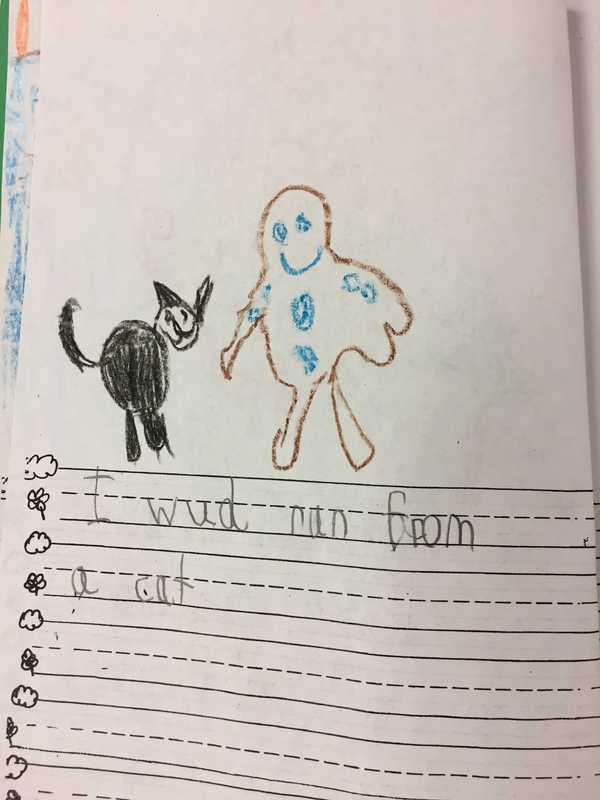 The gingerbread man writing prompt comes from The Education Center. 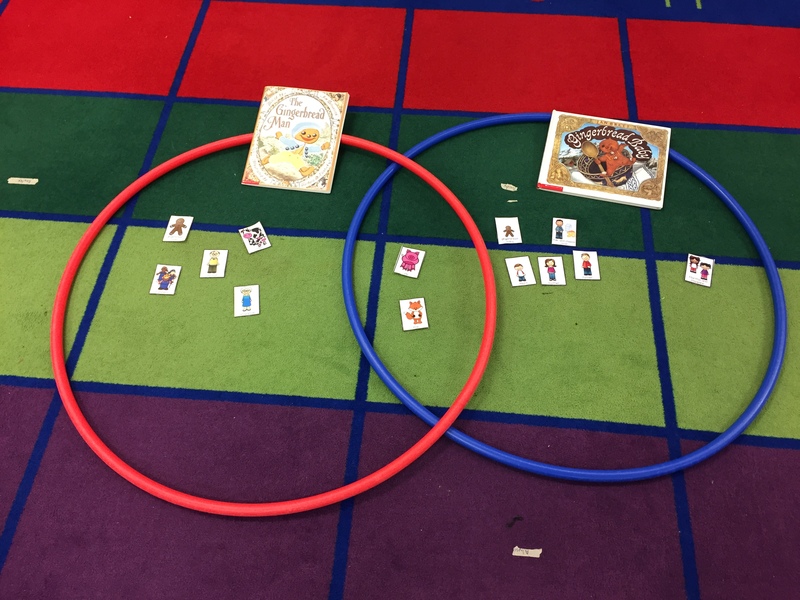 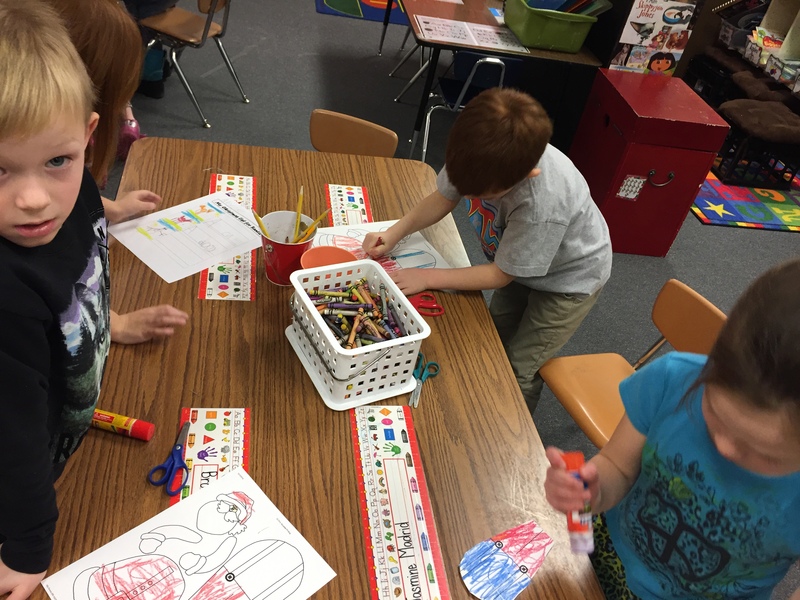 We compared the characters from the story from Gingerbread Baby to the characters from Gingerbread Man using hula hoops and character cards. 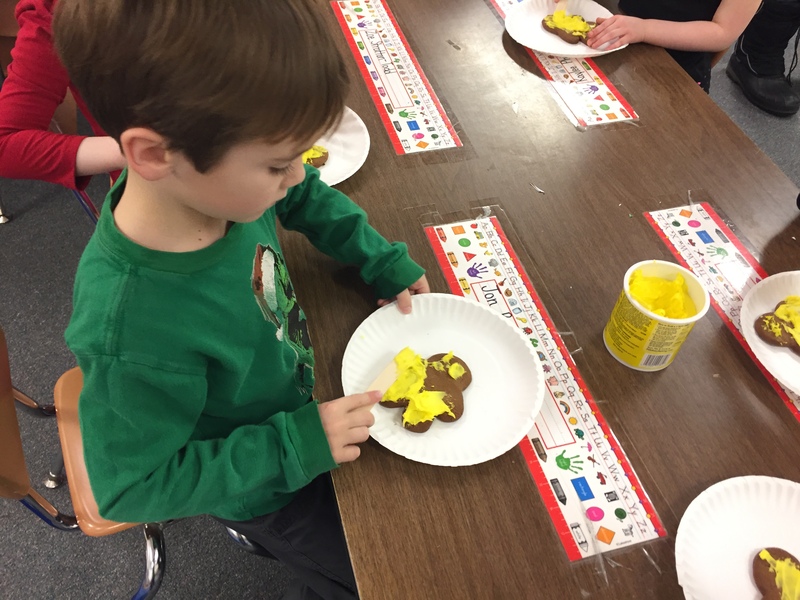 Then students made gingerbread houses for the gingerbread baby.